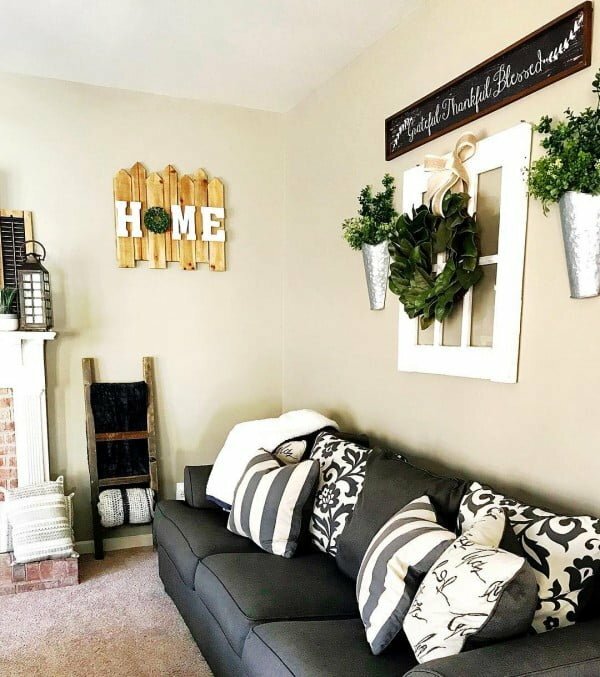 Looking for ideas to decorate your living room in a cozy and charming farmhouse style? 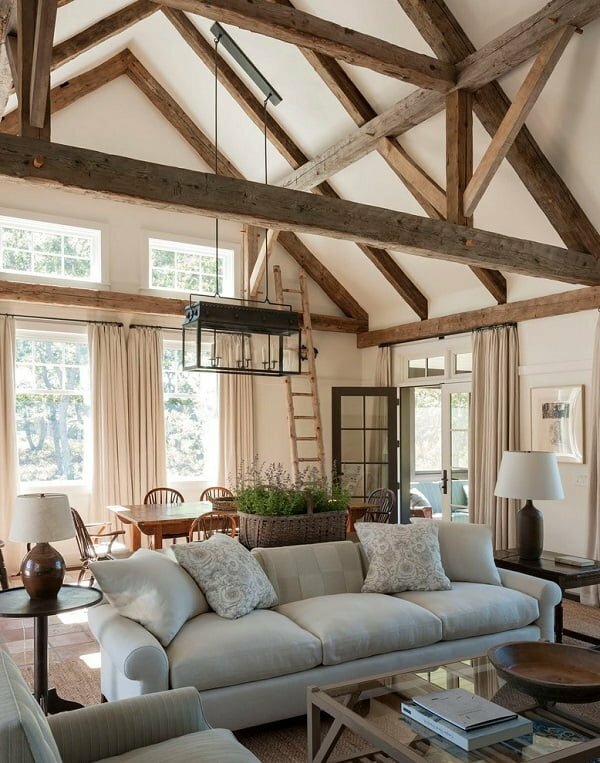 Here are 100 perfect farmhouse living rooms for your inspiration. 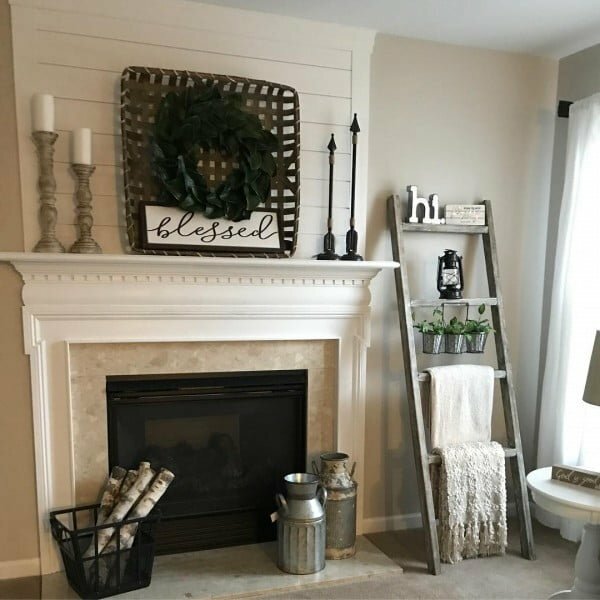 The farmhouse decor style is cozy, relaxing and can be customized to suit a modern or traditional aesthetic. 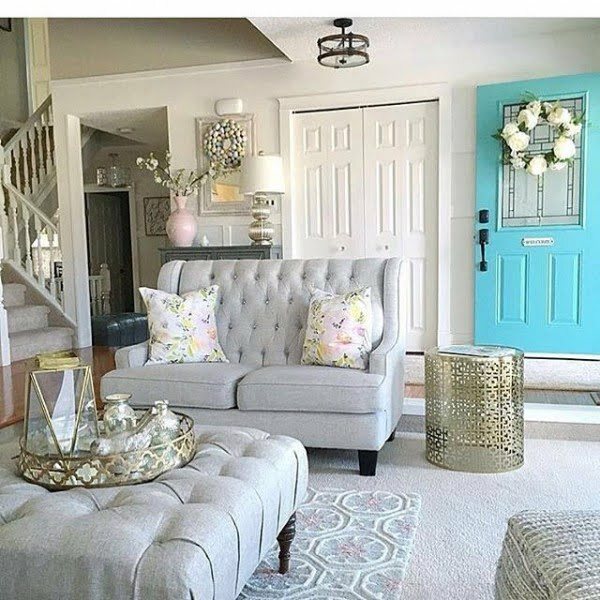 This interior style is so beautiful and versatile you can effortlessly infuse bits of virtually any design style you prefer. 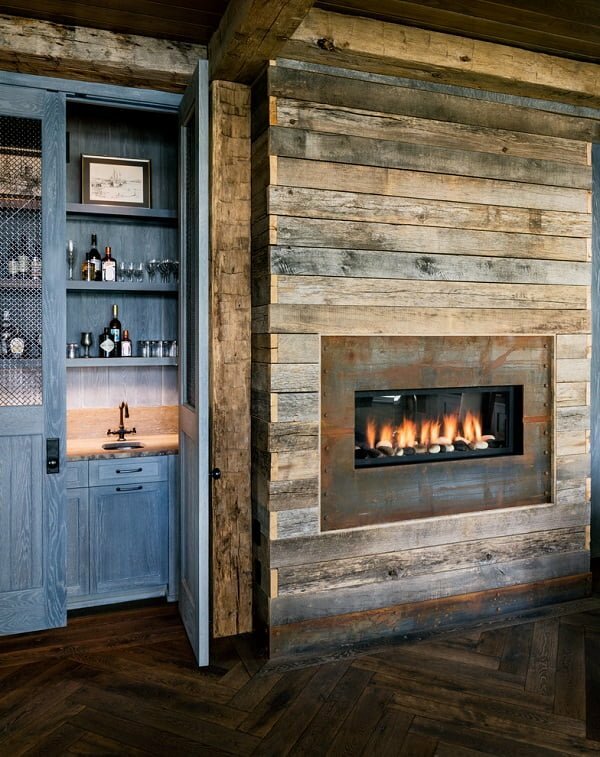 The farmhouse style has rustic elements in it while being simultaneously relaxed and light. It does not heavily depend on the use of wood. This serves to lighten the weight of the space and evoke a feeling of both informality and modernity. Also, the style makes use of elements such as a classic stone fireplace and cozy fabrics to bring warmth and comfort to space. 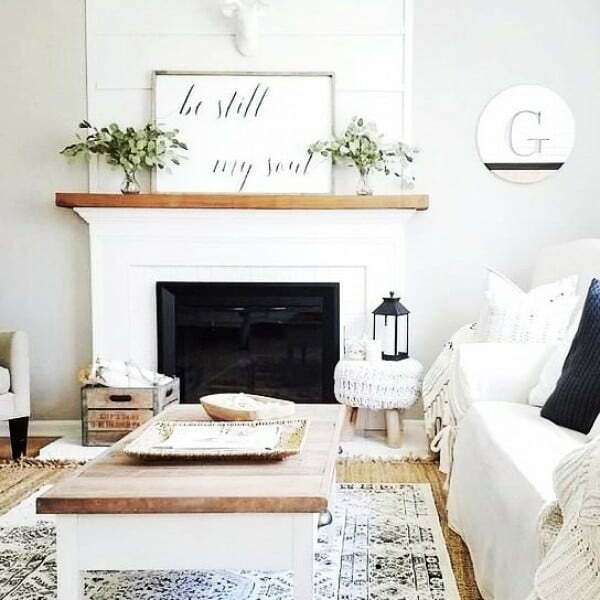 Below are some farmhouse living room décor ideas. 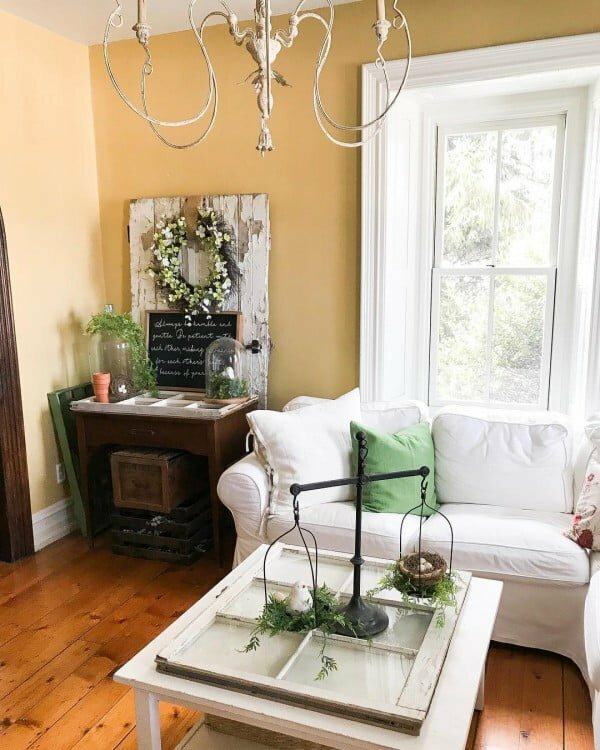 These ideas can be used to bring some farmhouse charm and incredible style to one of the essential communal spaces in your home. 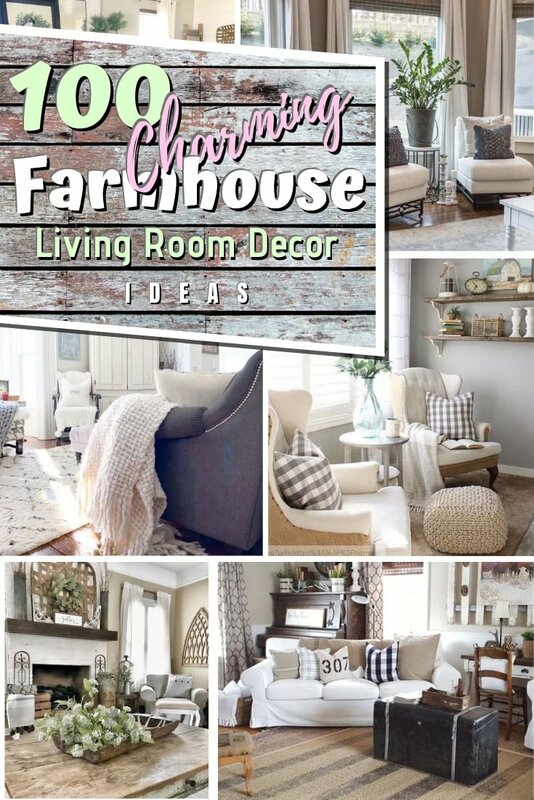 You will undoubtedly feel the farmhouse vibe in each of these remarkable designs. 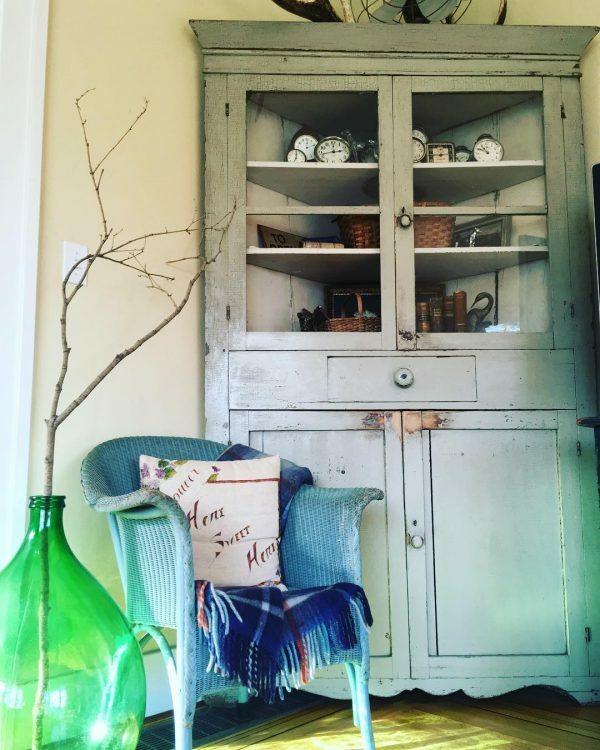 White paint was used to transform this hutch into a piece fit for fabulous farmhouse living. 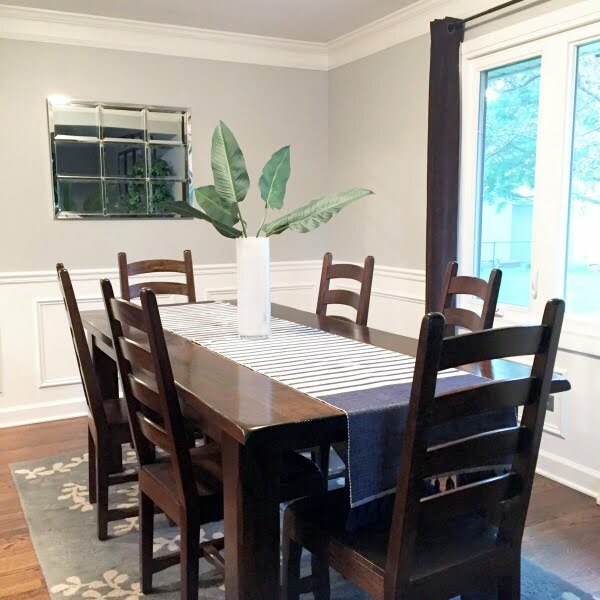 Its transformation has made it fit for its role as a centerpiece. This beautifully layered living room is filled with eye-catching delights, and each piece exquisitely complements the other. The dough bowl centerpiece adds character to space. 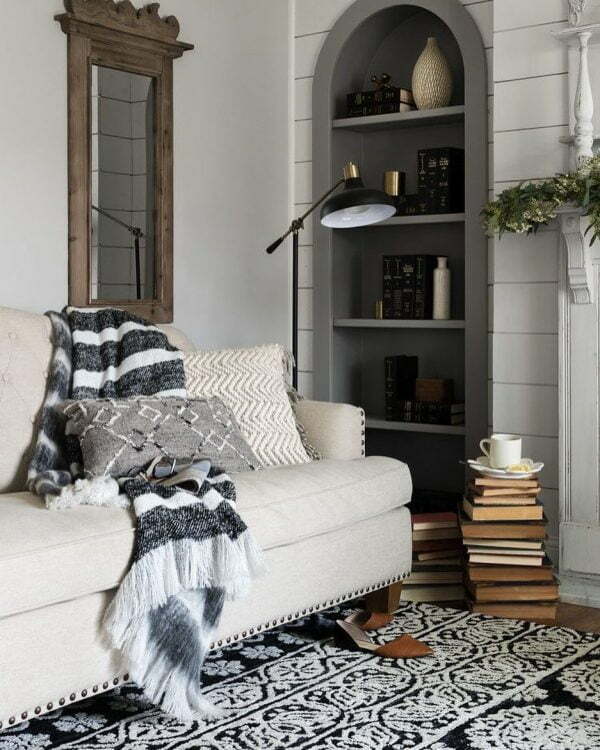 These bookshelves, with their tasteful accessories, are adding both interest and coziness to this intricately designed space. The wooden shelves on the white L brackets create a beautiful contrast. 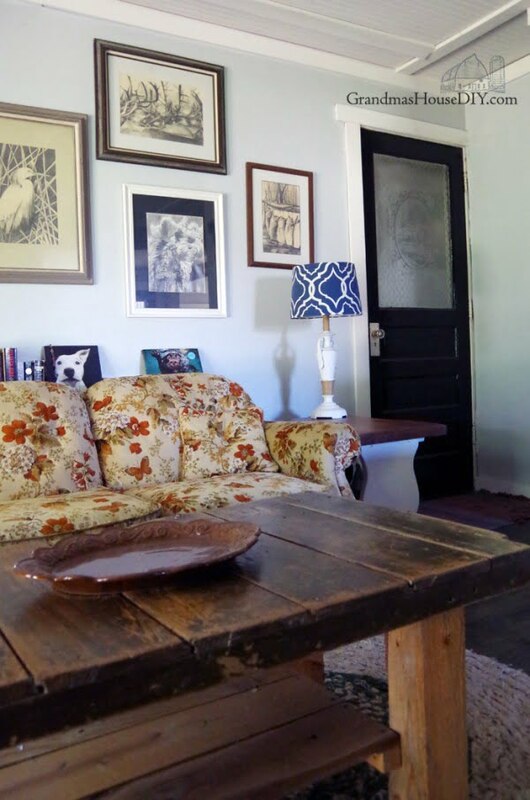 This space is filled with scavenged items that have been beautifully repurposed to create a comfortably cozy space. It beckons to the weary with a promise of relaxation. 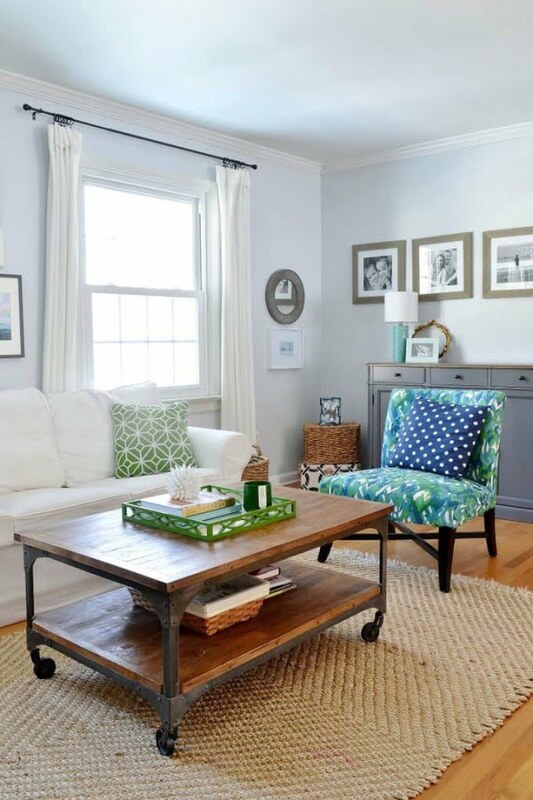 This space correctly displays how to tastefully mix patterns and textures. 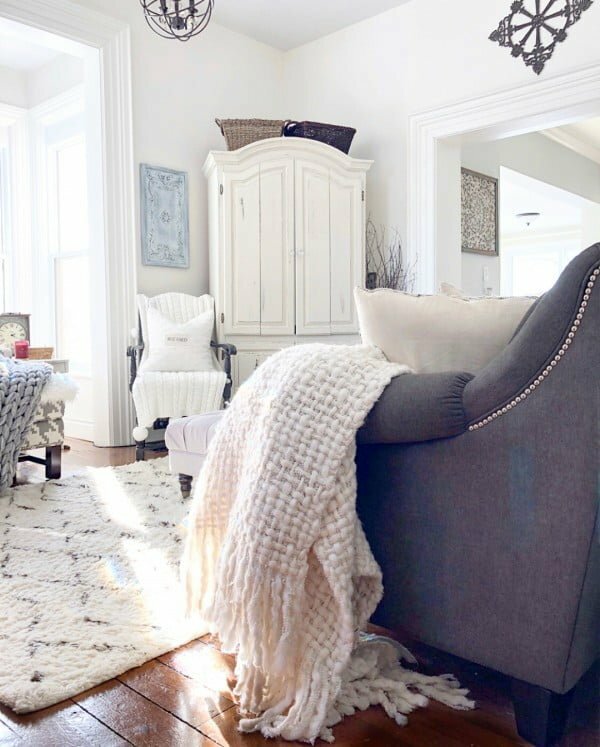 From the chevron chair to the rustic ladder covered in complimentary throws, this space is fantastic. 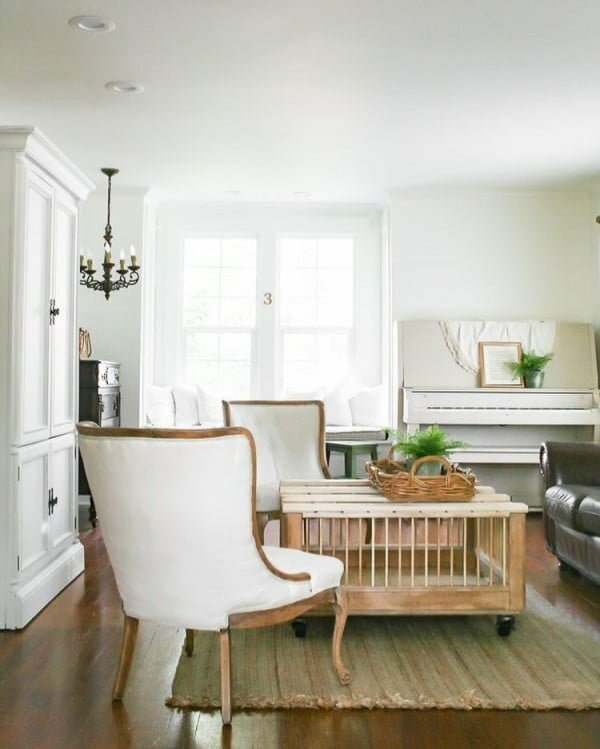 The classic lines of these beautiful white chairs set the perfect tone for the light, an airy living room that has been created. 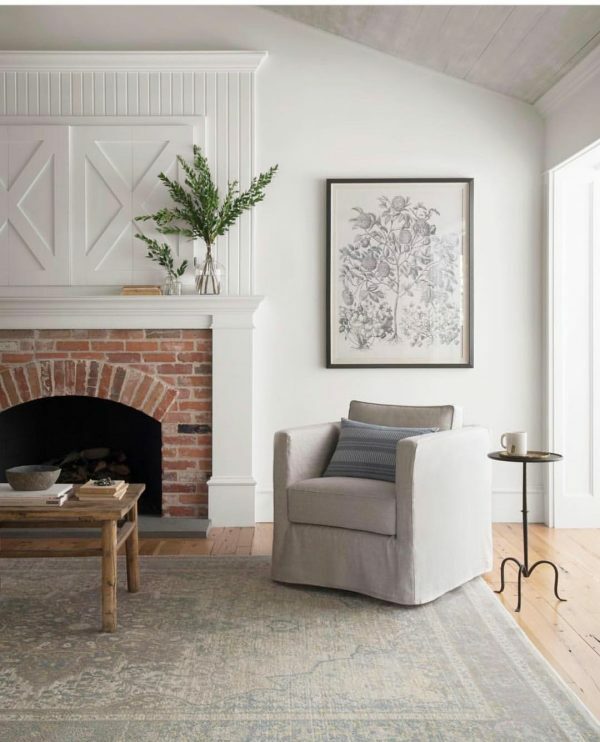 The styles and textures in this divinely designed space have combined to successfully create a look that’s classic, yet nostalgic and simple, yet stylishly elegant. 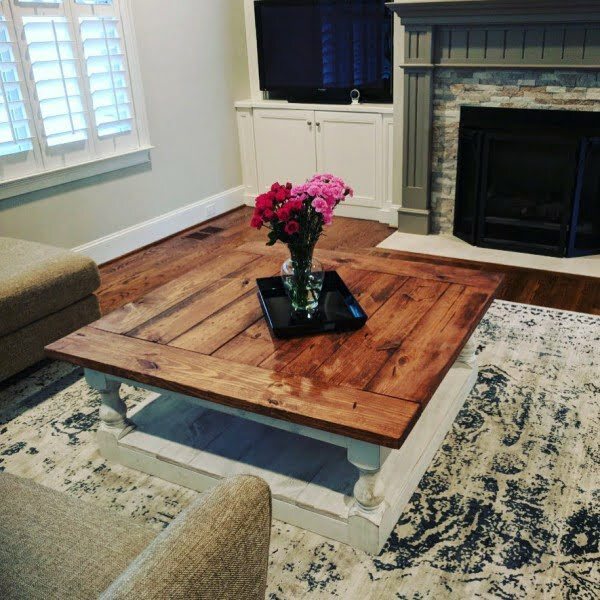 This handcrafted coffee table is majestic in its simplicity. 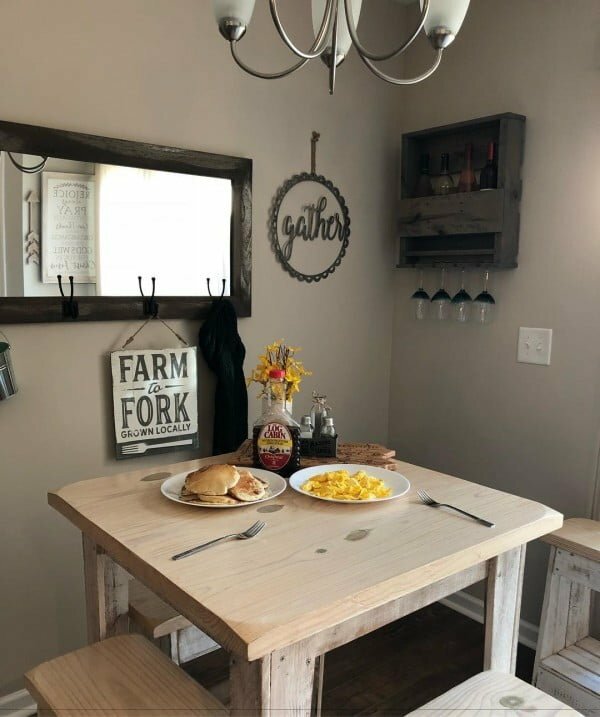 It masterfully combines natural and painted wood and offers a contrast so remarkable it effortlessly embodies the farmhouse style. 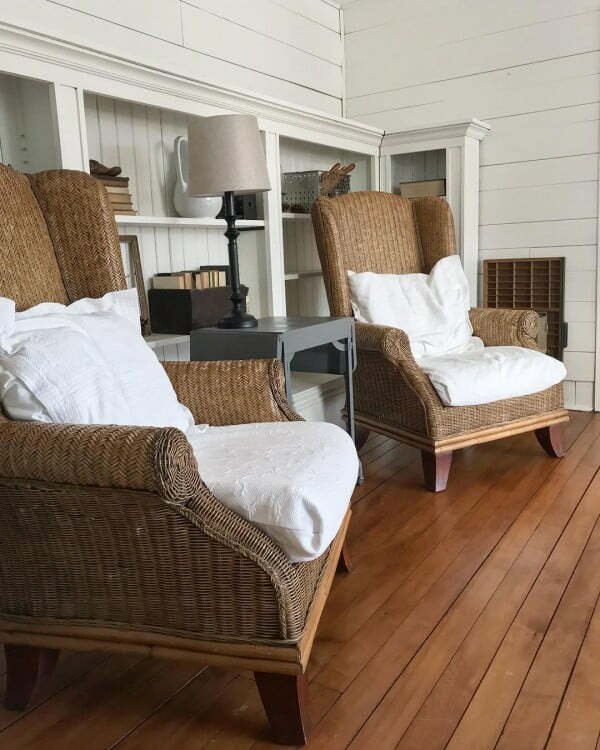 These wonderfully worn wicker chairs bring much style and depth to this living space. They are also a perfect complement to the wooden floor. 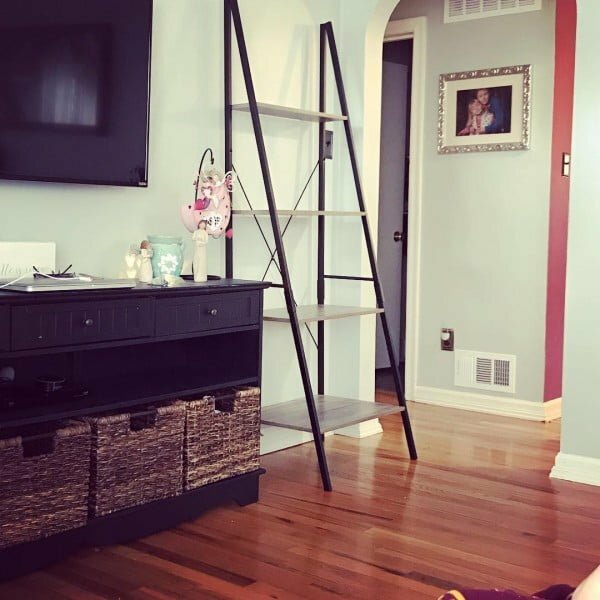 This grand ladder shelf provides a lot of space for the display of your favorite accessories. The possibilities are limitless when it comes to choosing your décor items. 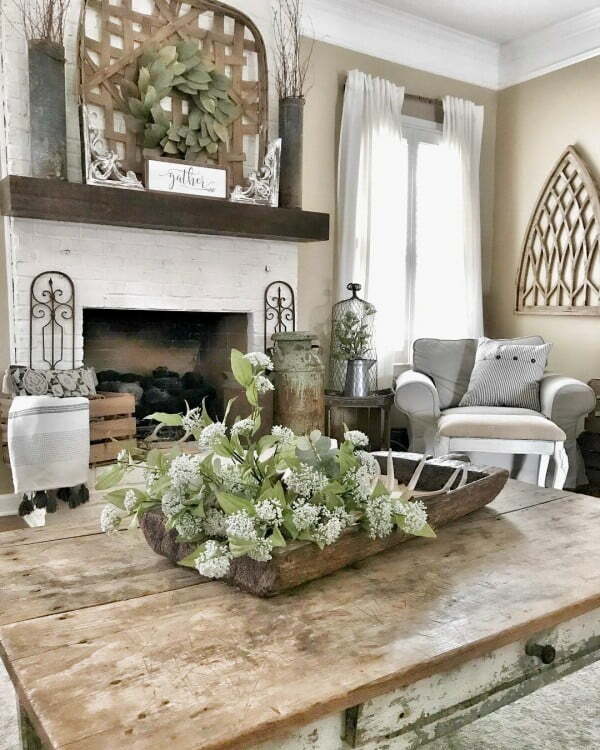 This wonderfully weathered handmade table and benches in the corner of the space bring both function and aesthetic appeal to this farmhouse living room. 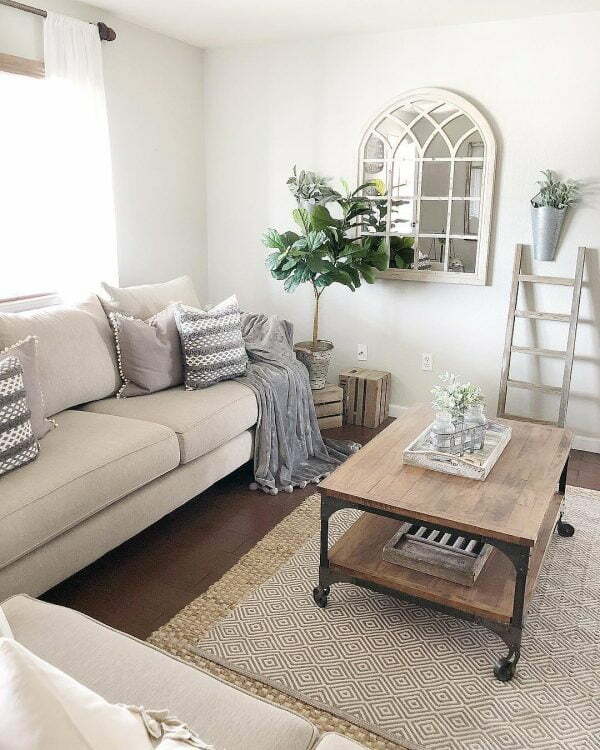 This living room exudes a vibe of simplicity and comfort. Its understated style creates the ideal space for this eye-catching and craftily designed two-toned coffee table. 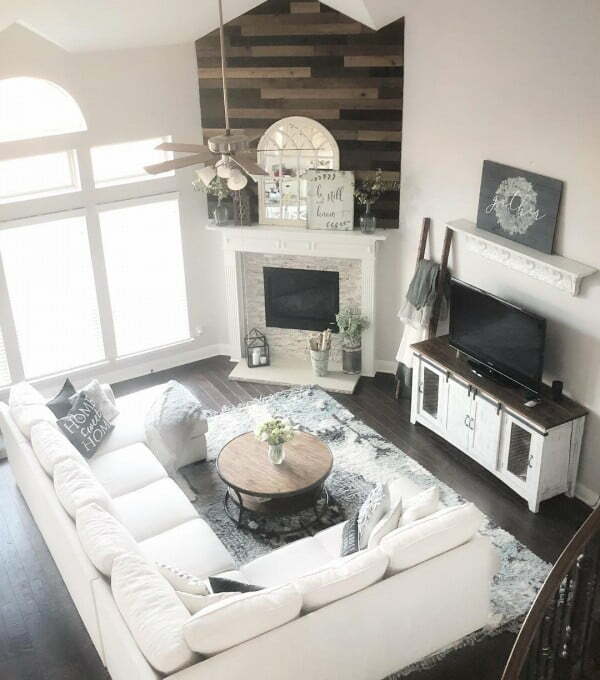 This living room displays style from its floor up. The white on white design, with its walls and furniture, is blissfully complemented by wooden elements around the space. This incredible space is a delight, and its visual impact is crisp and refreshing; from the chairs to the coffee table and the hutch in the background. 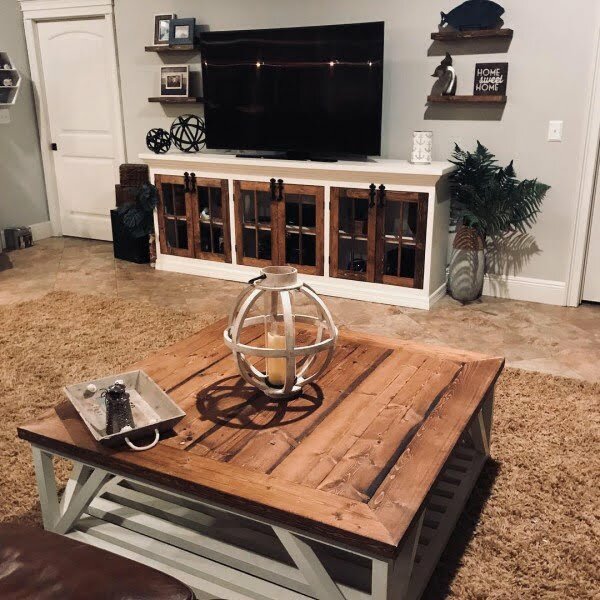 From its eye-catching entertainment console to its farmhouse style coffee table and floating shelves, this space exudes marvelous perfection. 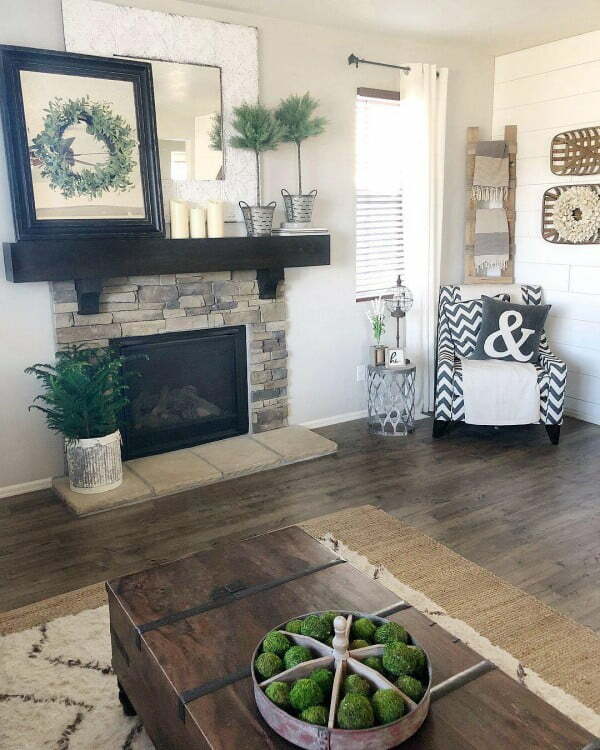 The accessories beautifully tie the room together. 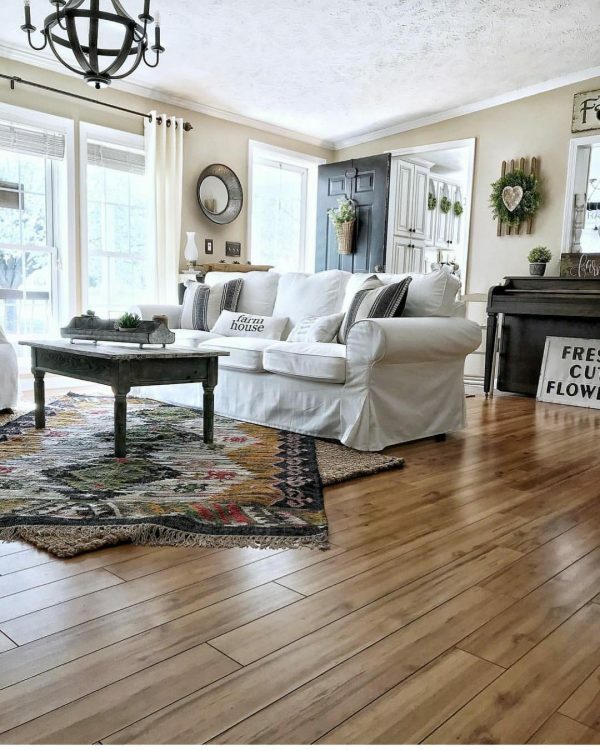 There is no denying the fantastic appeal of this charming and beautiful farmhouse oasis. The excellent coffee table centerpiece adds incredible flair to the room. 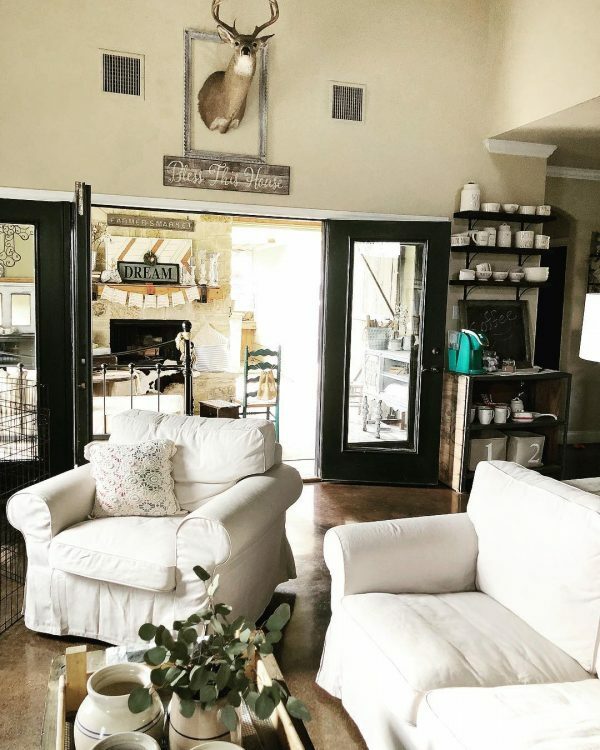 This beautiful and cozy retreat seems to have an open invitation for those who would like just to hang out and soak up some well-needed comfort. 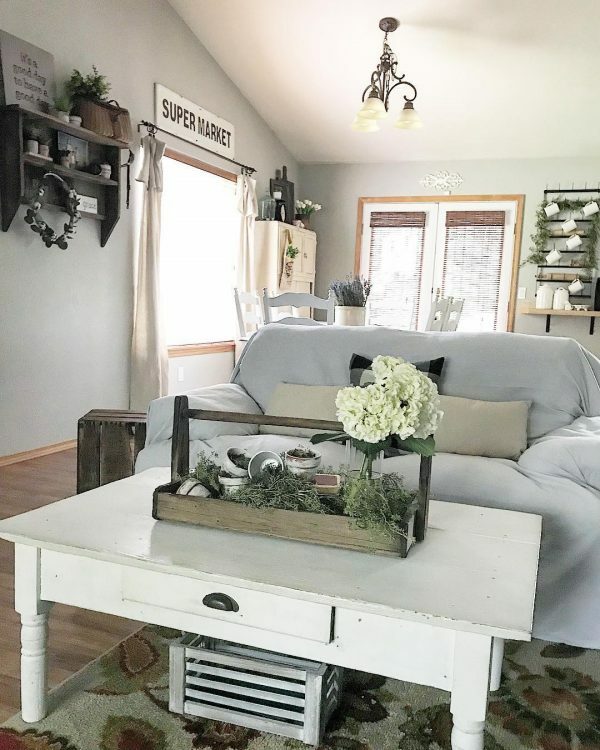 From the industrial cart in its new role as a coffee table to the perfectly placed pillows and other accessories, this space is blissfully breathtaking. The crisp, clean look and feel of this space are designed to welcome its users and invite them into its cohesively cozy environs. 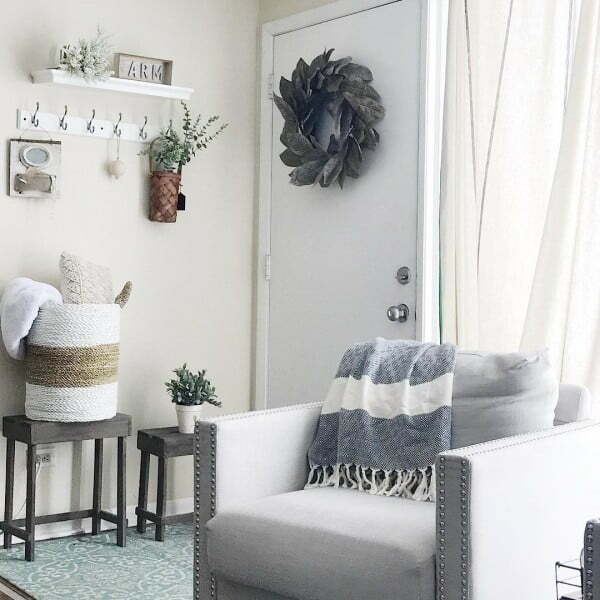 This space perfectly exemplifies how tastefully acquired accessories, like these bucket planters, can add unexpected delight and take a room to the next level of awesomeness. 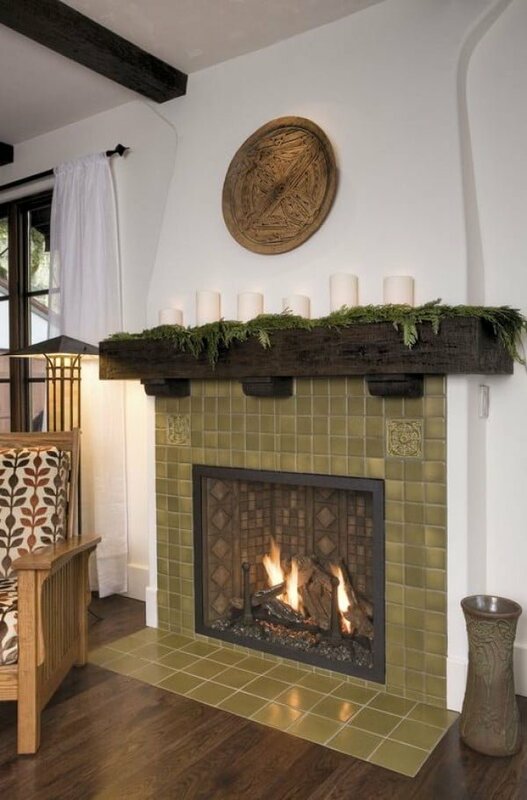 The fireplace is the natural centerpiece in practically any living space, and this one is no exception. The accessories on the mantle amplify its awesomeness. This space seems to echo the sentiment that home is indeed where the heart is, and sometimes peace is all that the soul requires. 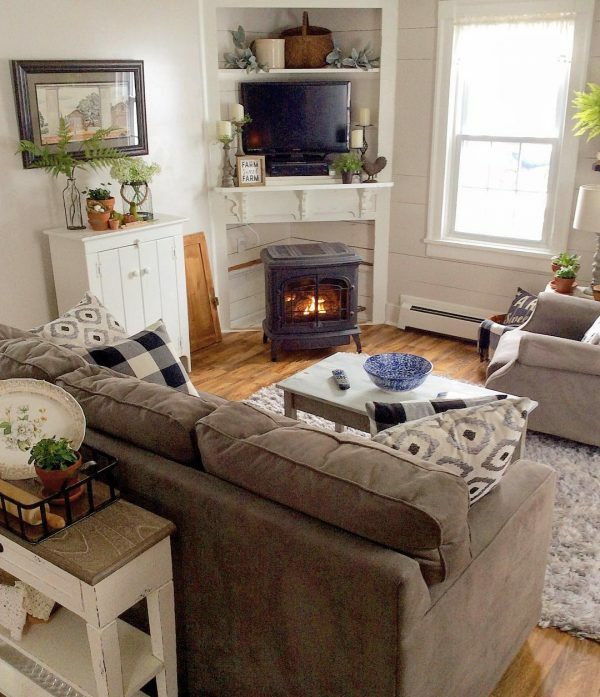 The gas fireplace brings old world charm to this cozy living room. The various textures and patterns also add to its comfortable vibe. There is nothing quite like a bright and cheerful room to lift the spirit and rev up the relaxation factor. 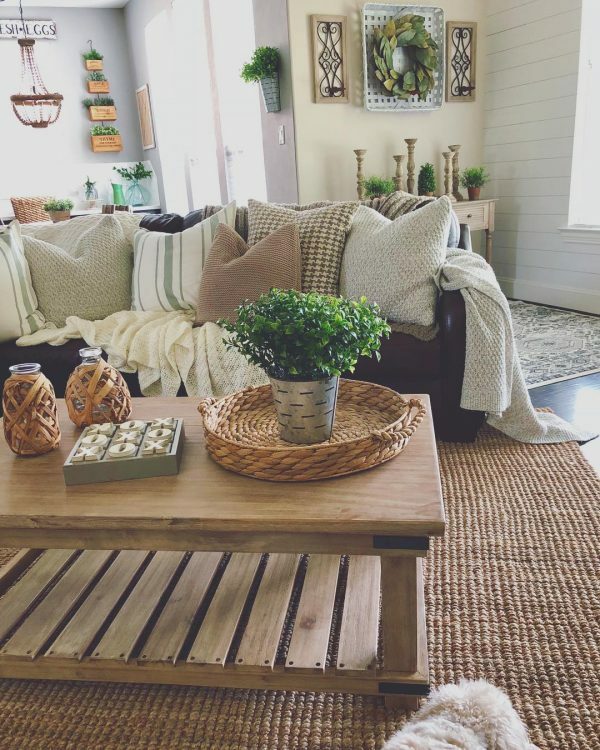 The classic modern living room look of this space creatively combines the modern organic look and the contemporary farmhouse style. Its mix of modern and antique pieces is simply sublime. 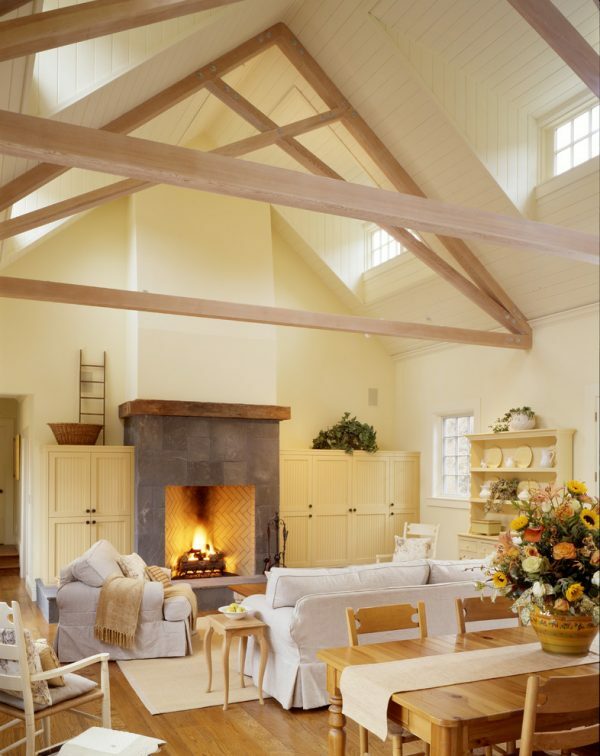 This white living space with its touches of wood beckons the soul to find stillness. This is greatly assisted by the eucalyptus and other beautiful accessories. This focal wall in this living space is contributing remarkably to the overall beauty of the area. The dark accessories add interest and charm to its neutral colors. 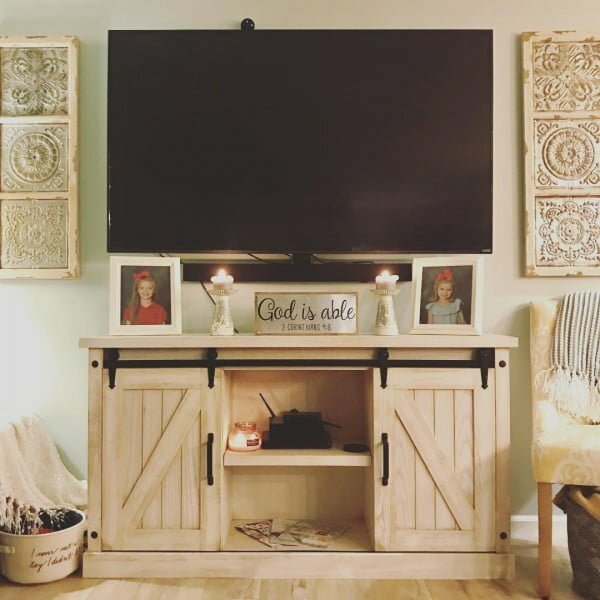 The simple, yet elegant look of this TV stand and the overall space are perfect examples of the coziness that epitomizes the farmhouse design. 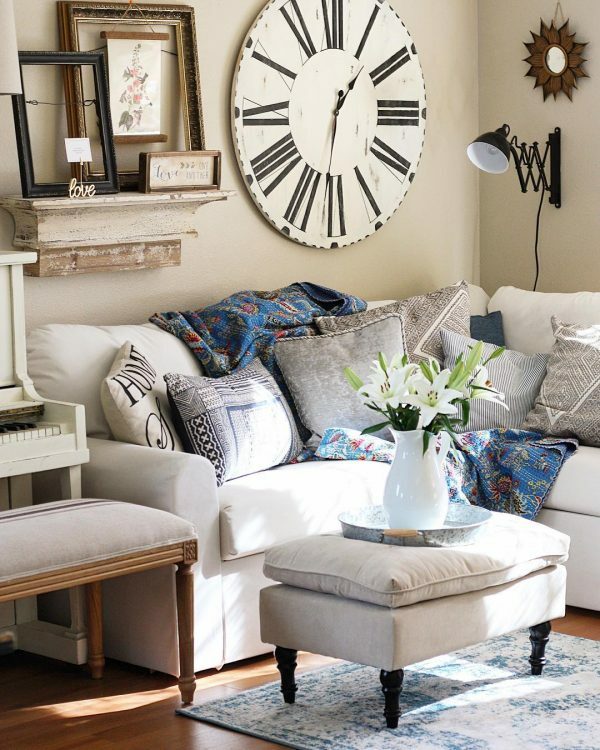 With its oversized and artfully-displayed rustic clock, cozy couch and beautiful accessories, this living room is the embodiment of warmth, comfort, and relaxation. 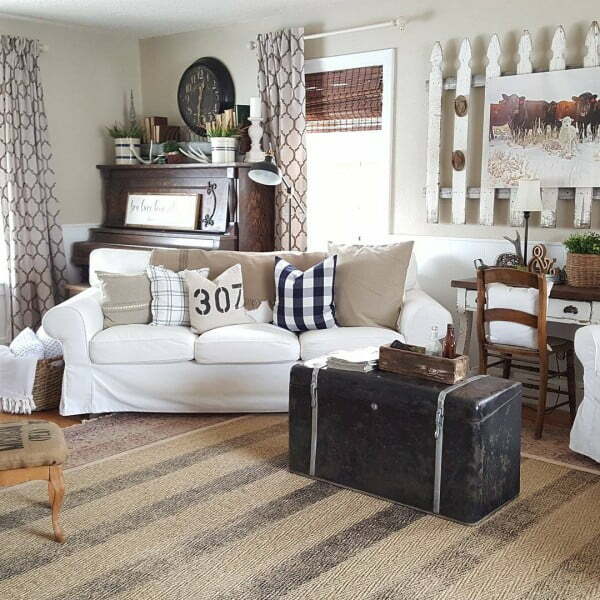 The wall color embraces the farmhouse-meets-modern country living room. 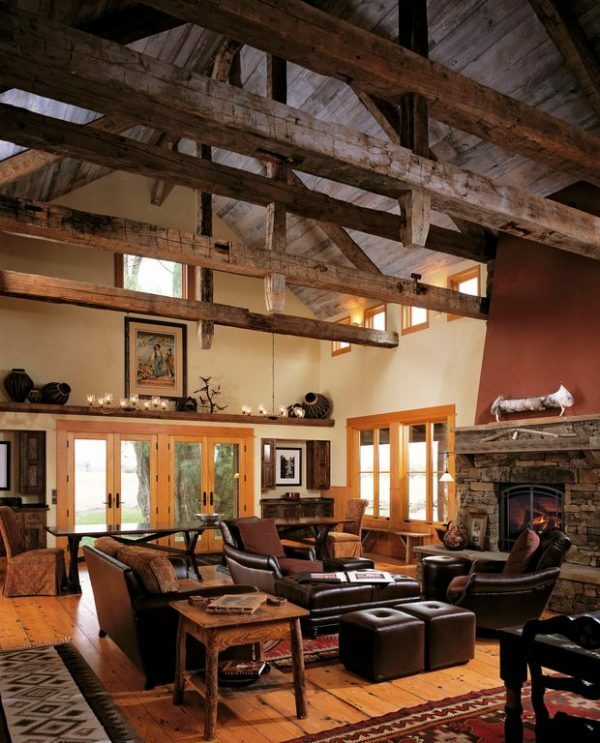 This space has more modern features than farmhouse ones but all in all, it is a beauty to behold. 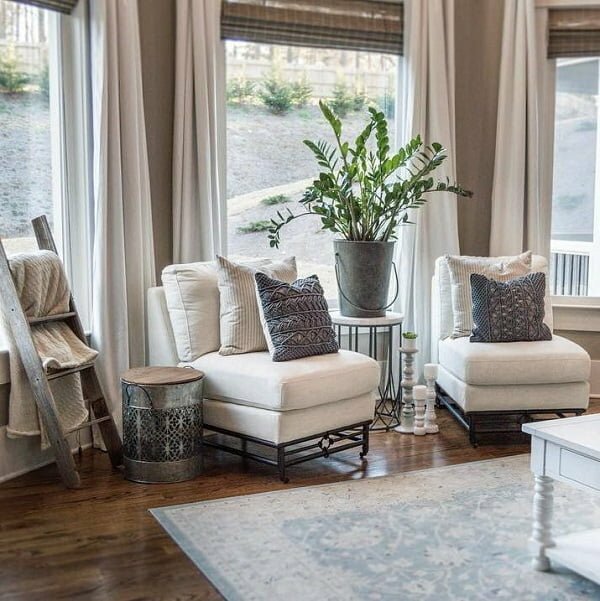 The clean lines of the couches, rectangular coffee table, complementary drum table, seagrass bench, and beautiful accessories all come together to create a cohesive, well-balanced space. The large, bright windows, glass coffee table and oversize area rug in this space provide a continuous view that highlights the spaciousness of the room. 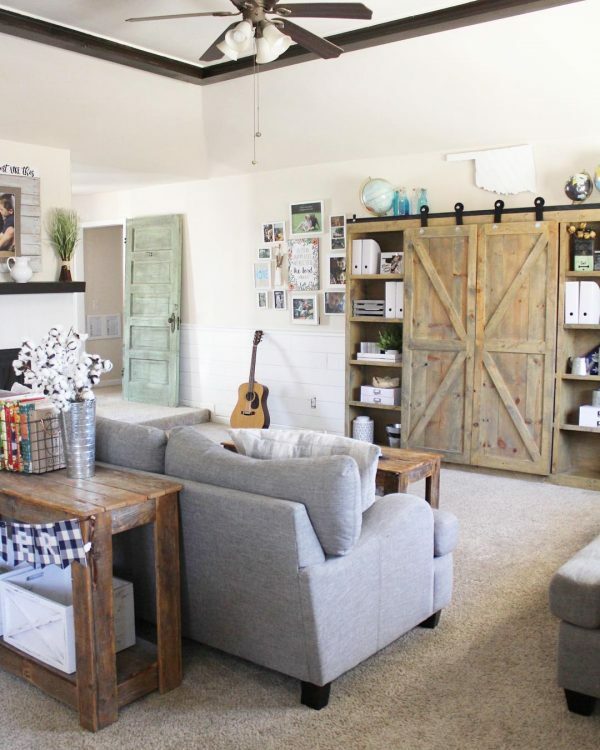 These over-sized, custom-designed sliding barn doors are undoubtedly the highlight of this space. 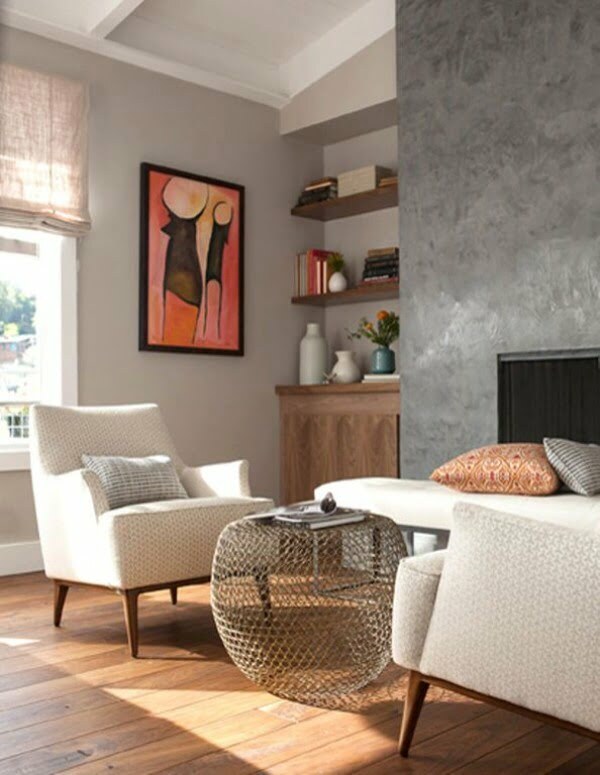 They are wonderfully complemented by elements like the color palette, concrete slab top, and the wicker ottoman. 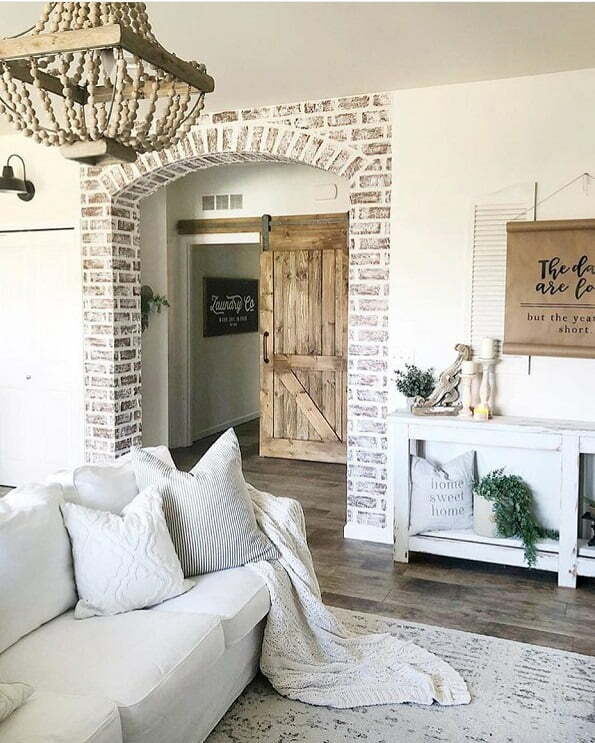 The traditional blue armchair and white sofa perfectly complements this living room with its white paneled wall and large farmhouse formal brick pavers on the floor. 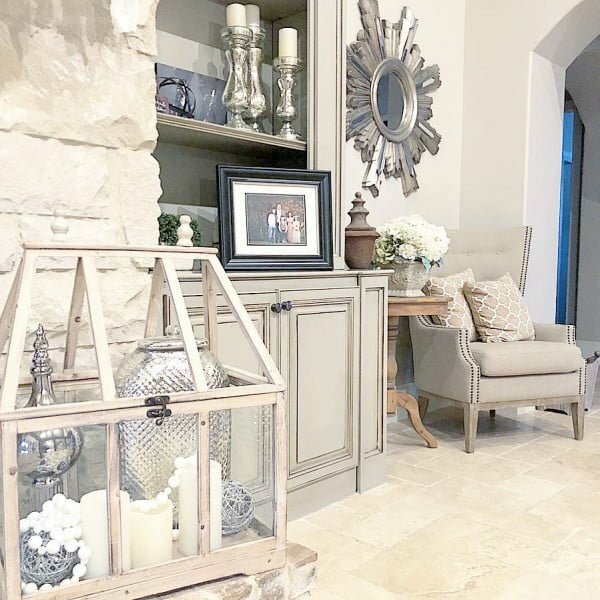 With its bi-fold doors, exposed beams, decorative mirror, and gray accent wall, this formal farmhouse living room is the embodiment of an exquisitely-executed large country formal space. 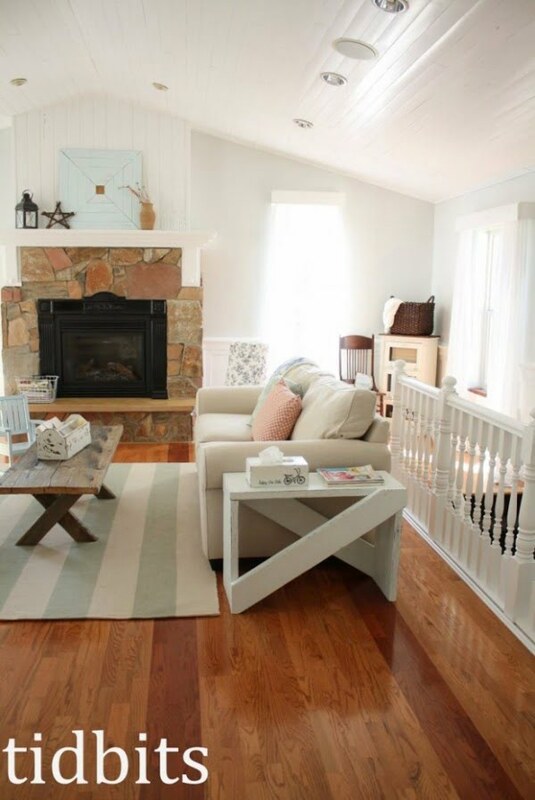 This all-white space is a remarkable example of a mid-sized country open-concept design. 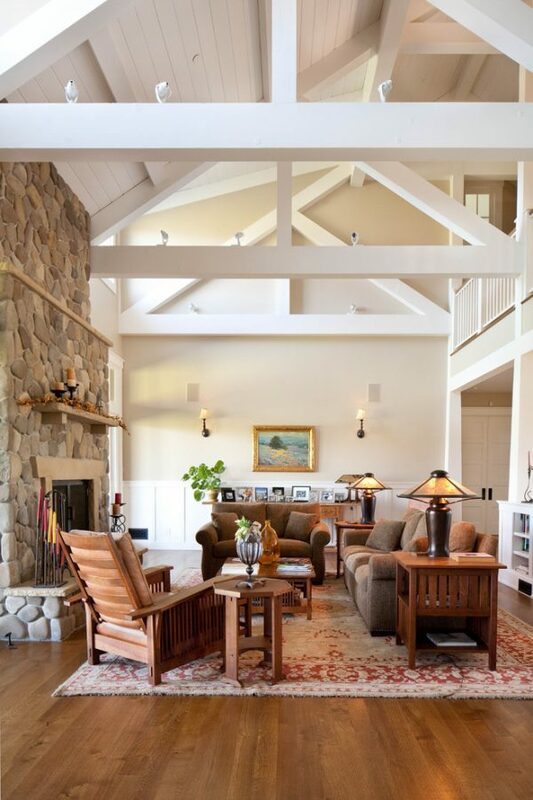 Its dark wood floor, glass-top coffee table, and other decorative elements add flair to space. 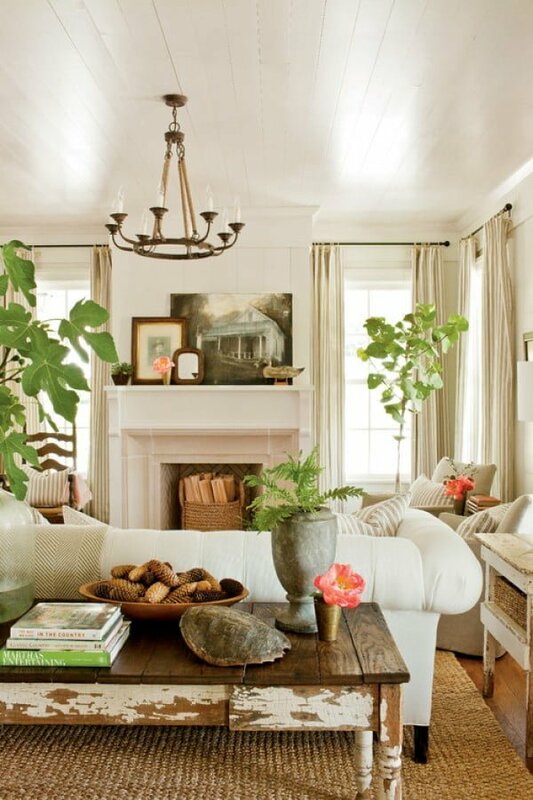 This rustic country living room, with its painted wood ceiling and wood walls, is superbly decorated with white sofa, white window treatment, sisal rug, and a remarkably rustic coffee table. 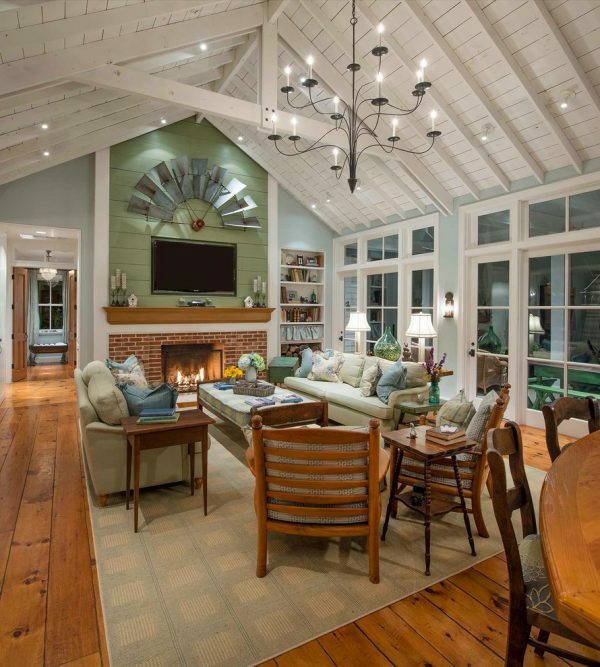 The whitewashed cathedral ceiling, exposed beams, and complementary window treatment cohesively combine to deliver a rustic vibe. 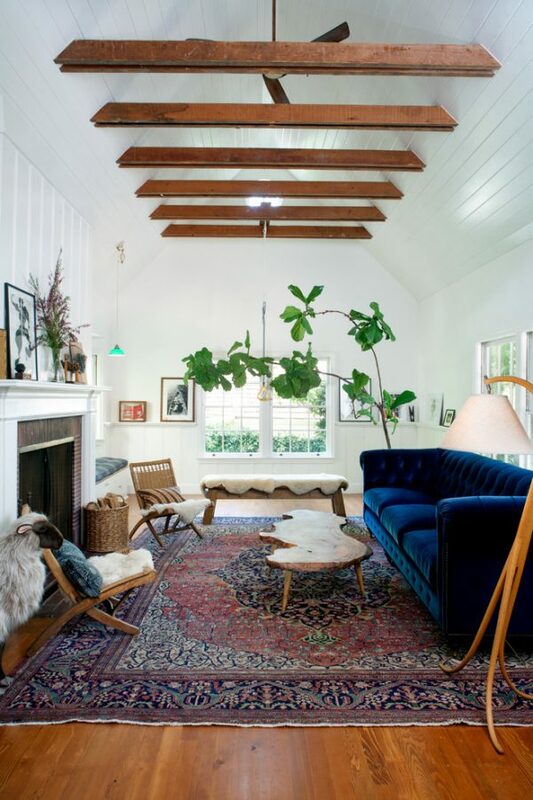 The green walls and red rug add to the ambiance of the space. 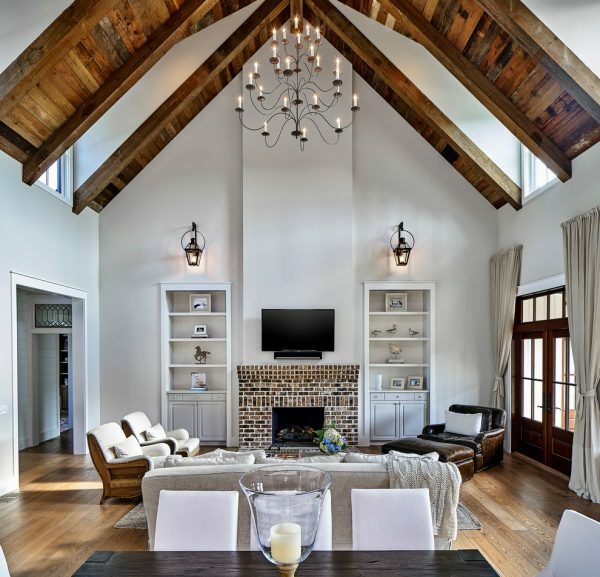 The stone feature wall, high ceilings with exposed beams and fascinating light fixtures in this living room come together innovatively to create an exquisite space. 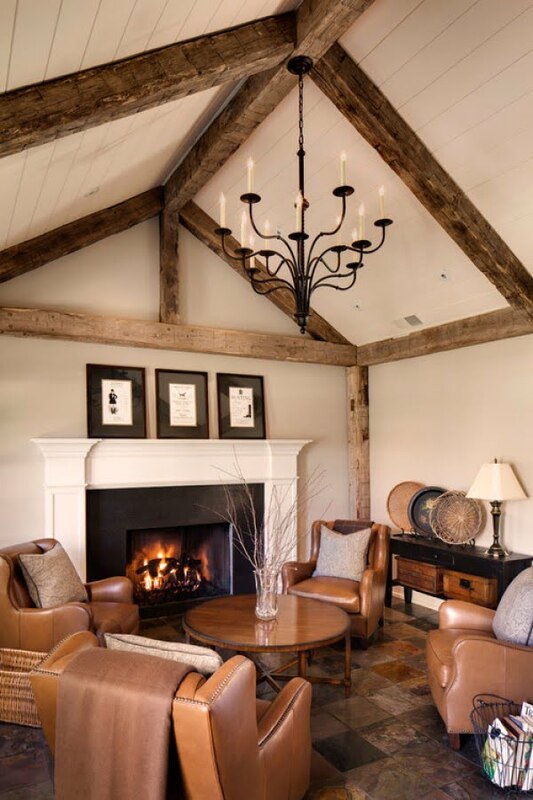 The slab surround on the fireplace in this farmhouse living room is made of honed Black Pearl granite; this helps to give the space a stately appearance. This space is chock full of visuals treats. 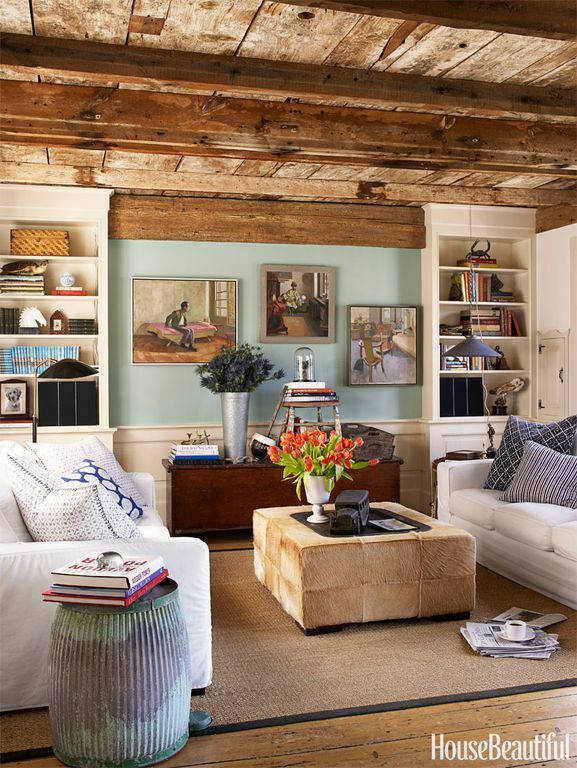 From its hardwood floor, exposed beams, built-in bookshelf and Roman shades, the striking beauty of the room are undeniable. This contemporary living room embodies the magnificence of minimalism in interior design. 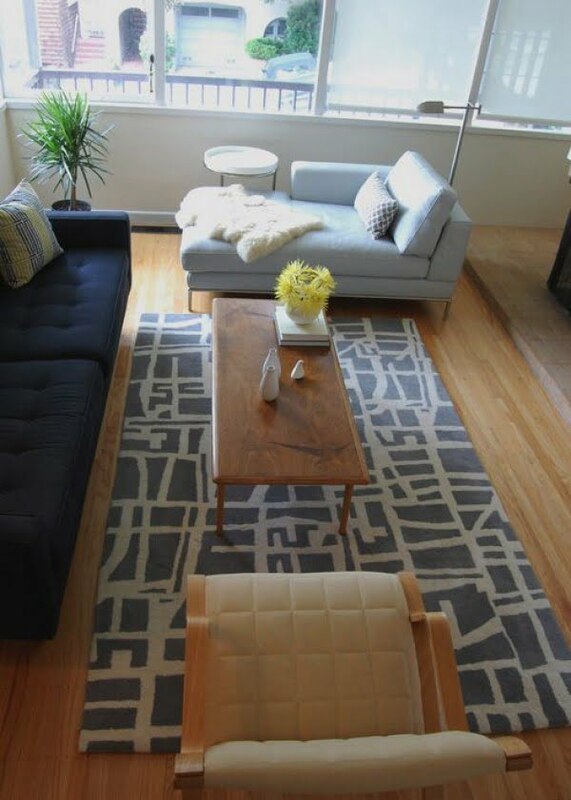 The neutral, understated colors are given a significant jolt by the graphic print of the rug. 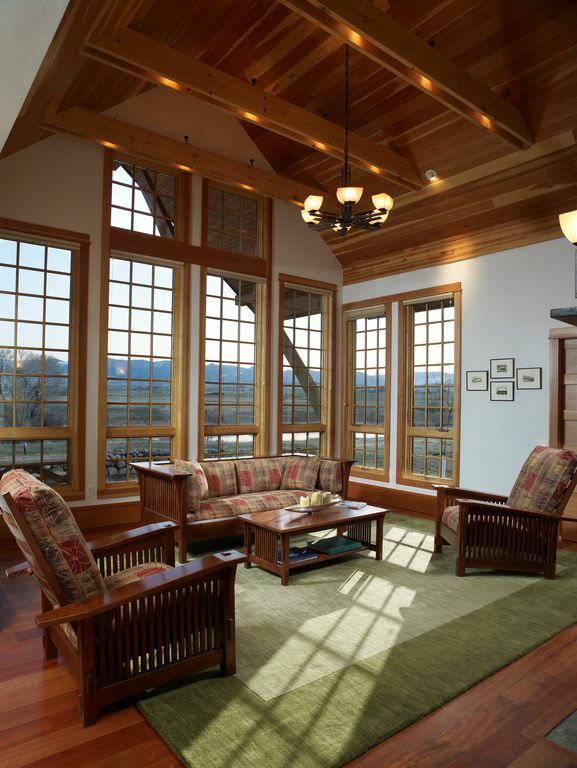 This traditional living room with its arched windows and French doors is quite appealing to the eyes. 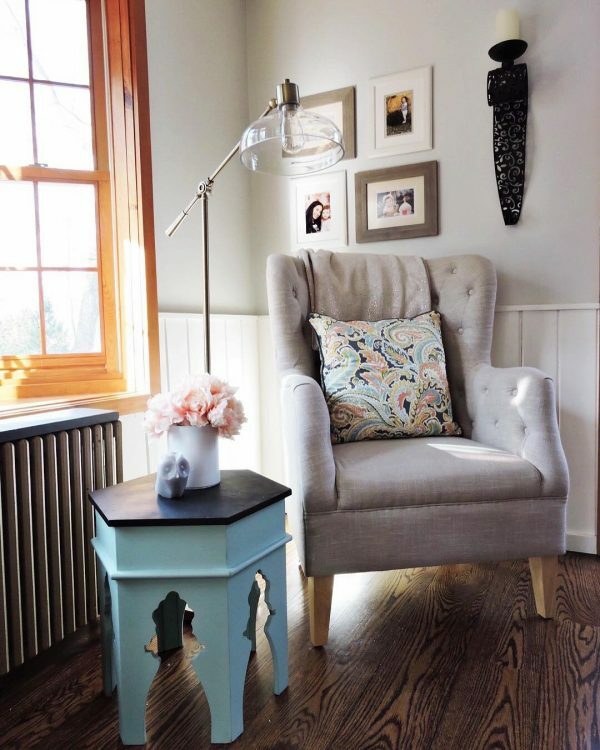 The ottoman and other accent pieces add both style and function. 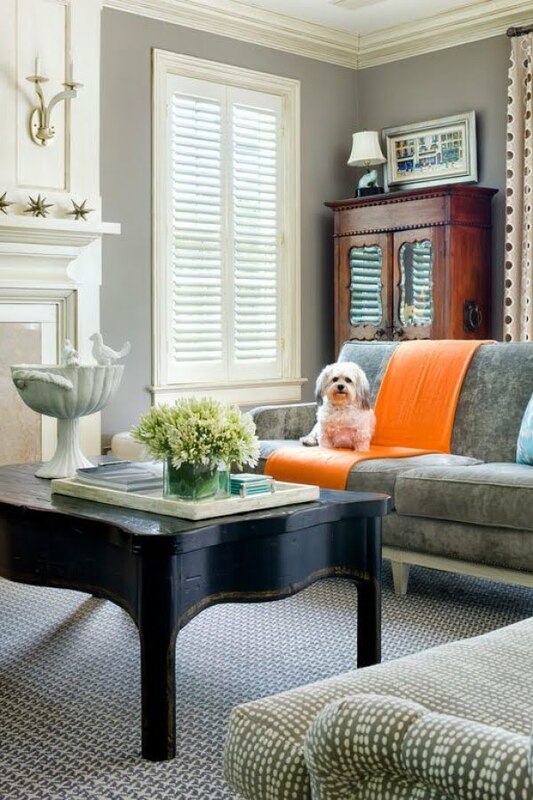 The striped area rug in this living room adds the remarkable pop of color this space needs. 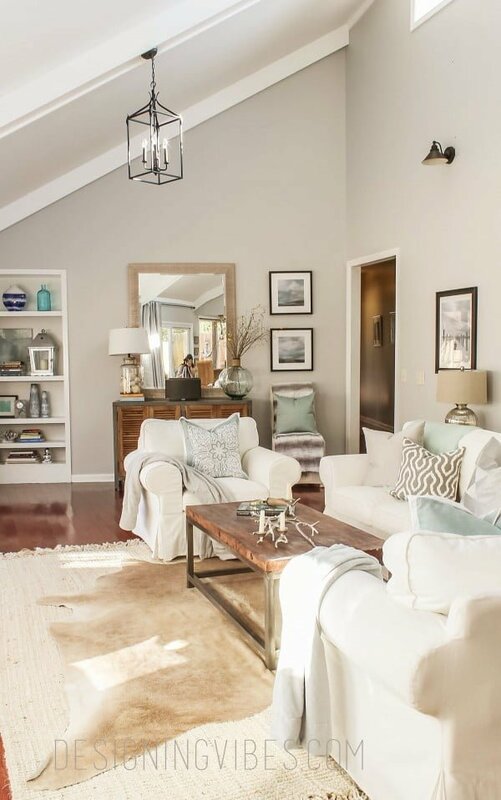 The light fixture does wonders to an otherwise neutral room. 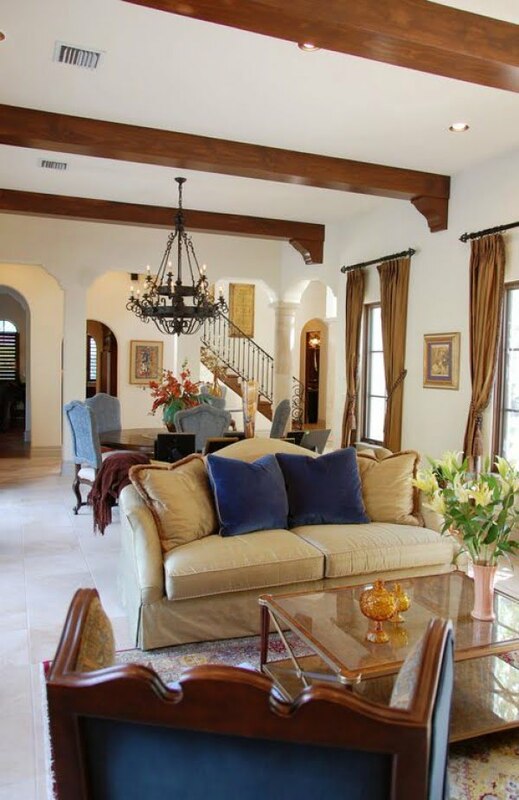 The exposed beams, chandelier, concrete tiles, columns and overall design of this living room come together perfectly to create a marvelous Mediterranean space. 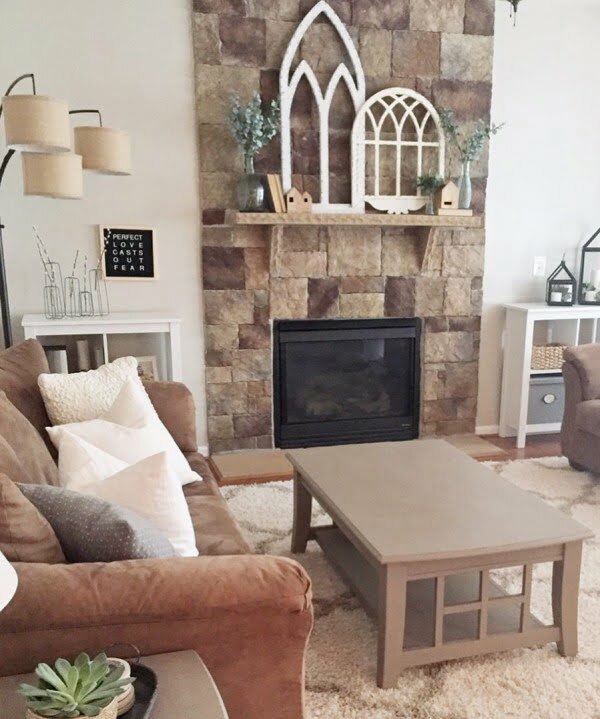 The clean, comfortable and spacious look and feel of this contemporary living room is mainly achieved through its color palette, high ceiling, and overall clutter-free vibe. 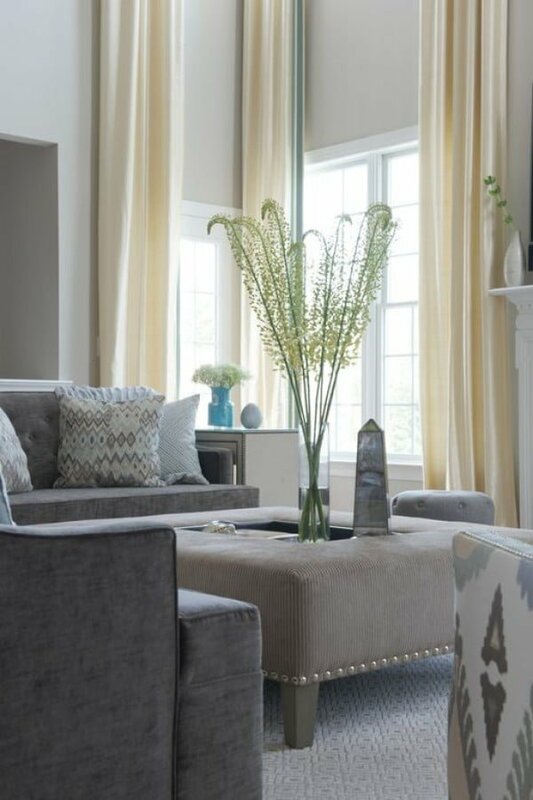 Every detail in this living room adds to the cohesiveness of the finished space. From the color scheme to the placement of the furniture and accessories, the room whispers perfection. 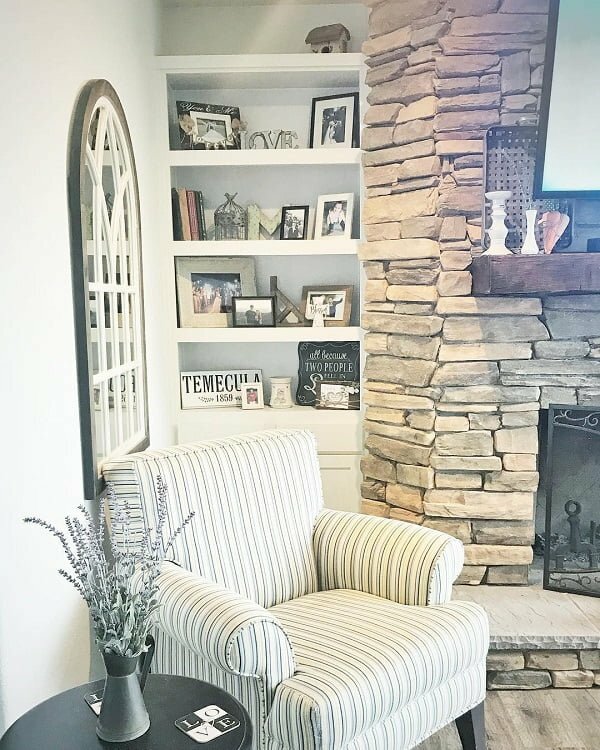 The armchair, vase and even the laminate flooring in this living all seem to be highlighting the fireplace, which is the obvious focal point in this space. This living room evokes a feeling of grandeur, and the height of the ceiling, the length of the curtains and tallness of some of the accessories are mostly responsible. Everywhere the eyes can see, something is fascinating to behold in this spectacular space. 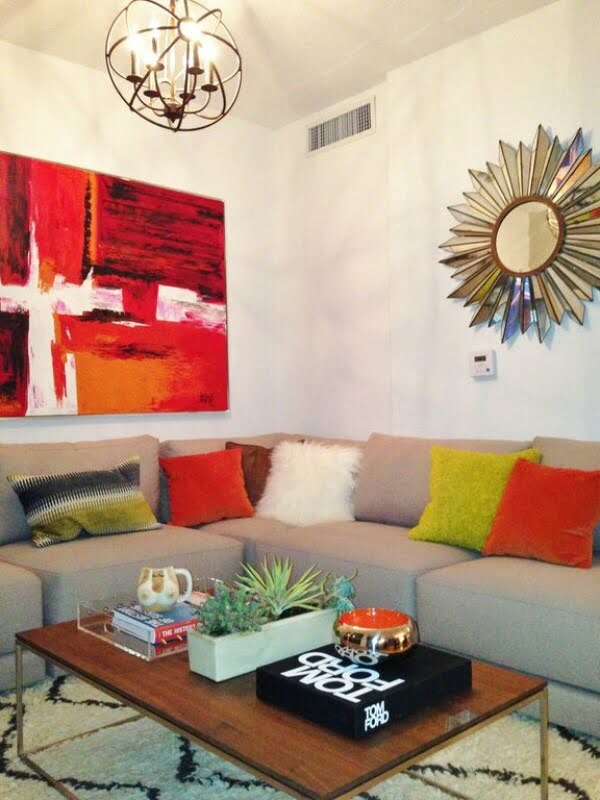 The neutrality of the walls and sofa is wonderfully contrasted by the bold colors of the accessories. The stained glass window, couches, and chairs in this living room are just some of the elements that bring much charm to this space. 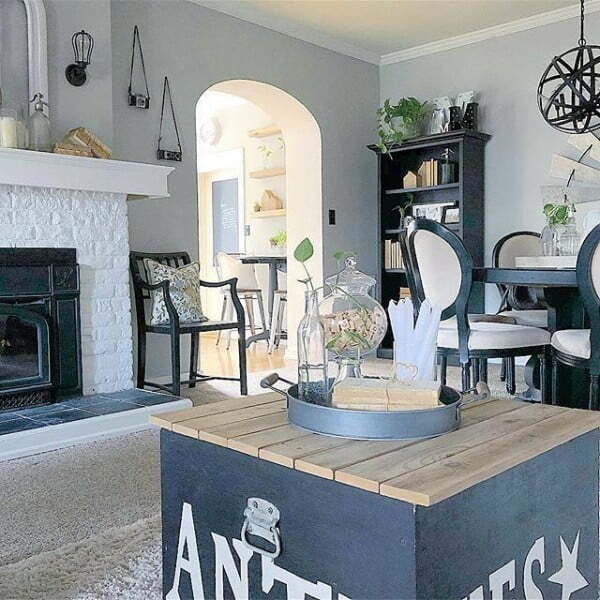 This living room has some details that combine to create an awesomely adorable space. These include the color scheme, framed artwork, and the beautifully reupholstered wingback chair. 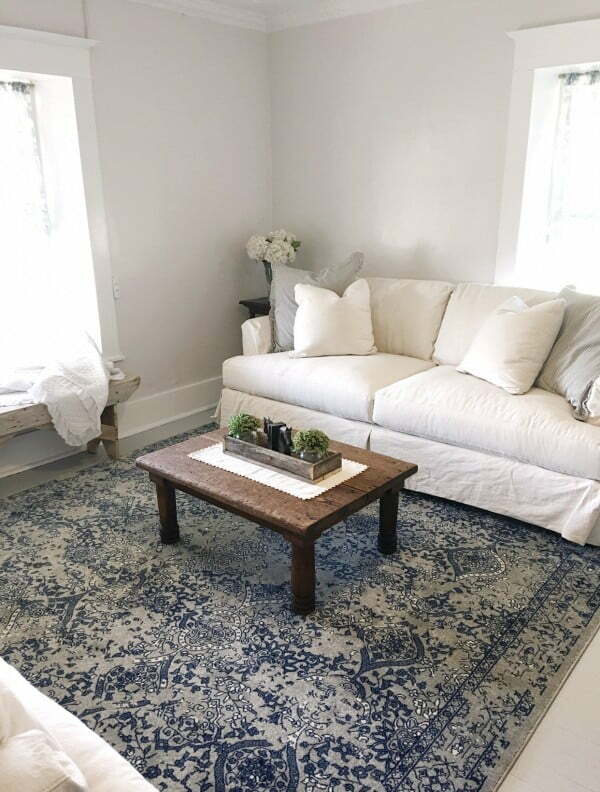 The infinitely exciting and intricately designed area rug in this farmhouse living room is the perfect anchor for the design of the rest of the space. This living room evokes innovation, and the visual interest of the space cannot be undermined. 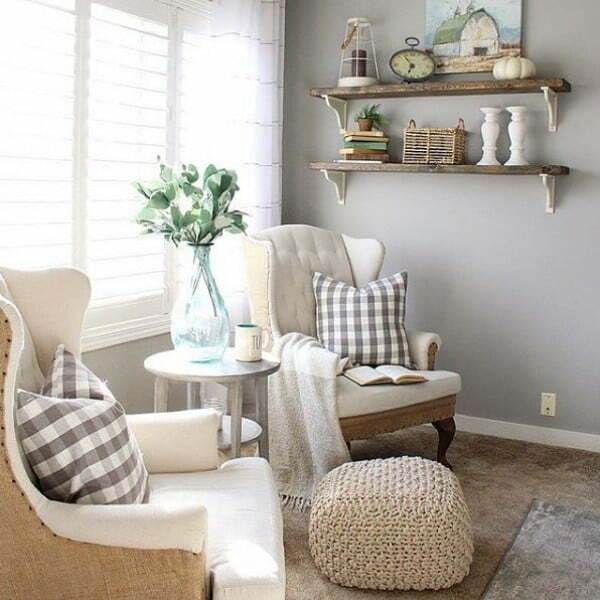 The re-purposing of the fireplace as book storage provides a charming touch. 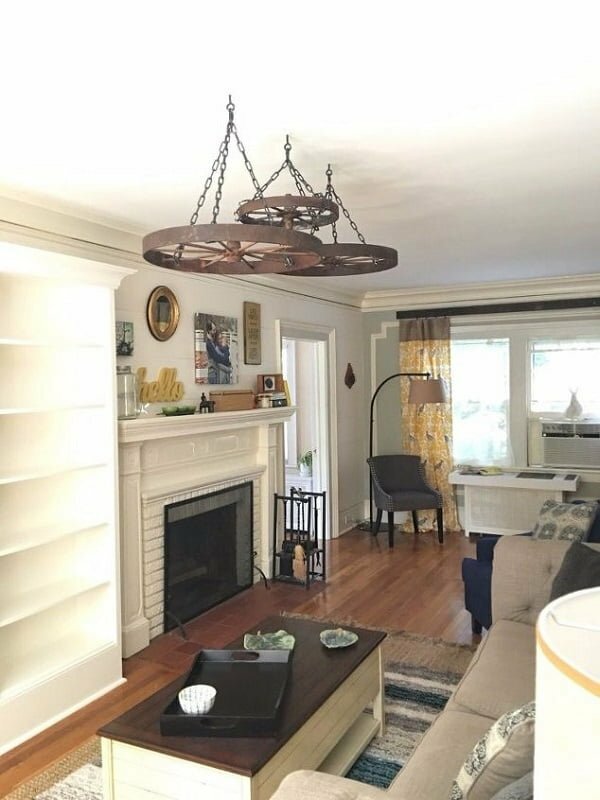 Adding three rustic wagon wheels to the ceiling of this living room has played a massive role in the awesomeness of the overall space. 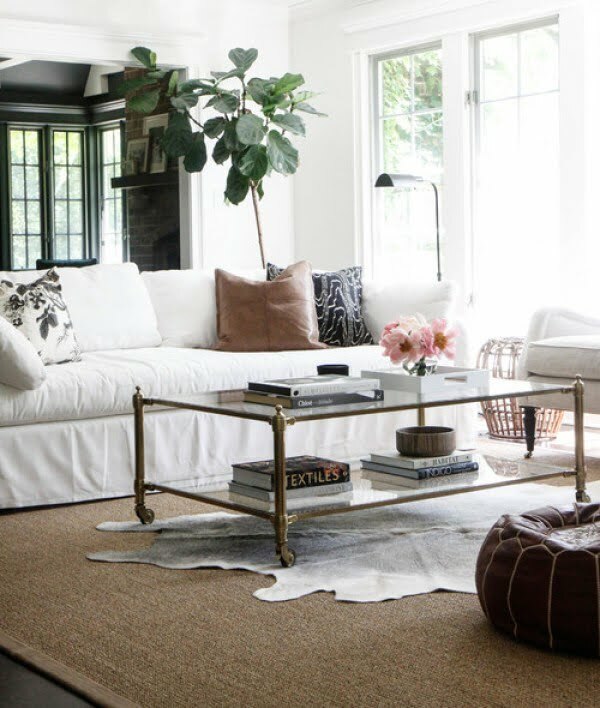 The light and airy look and feel of this living room can be attributed mainly to the color scheme and overall design of the space. 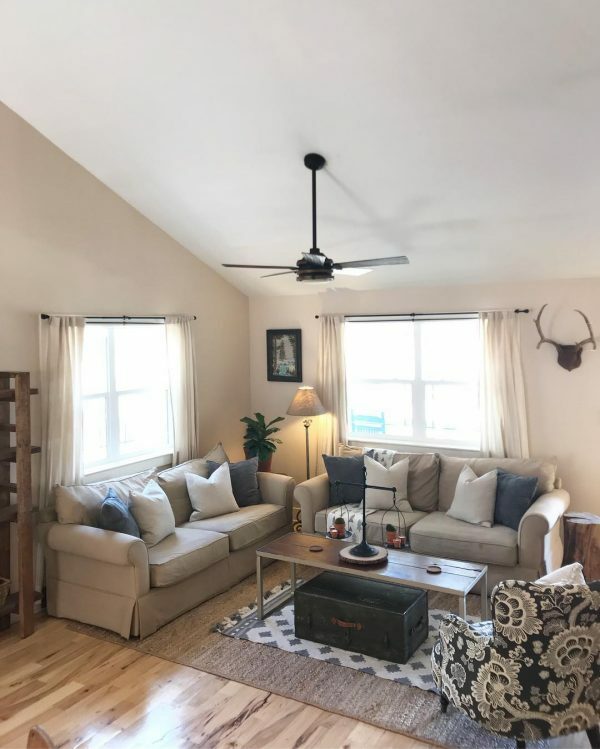 This light, bright living room is sure to provide a unique retreat for the weary and be a great space to spend time alone or with loved ones. 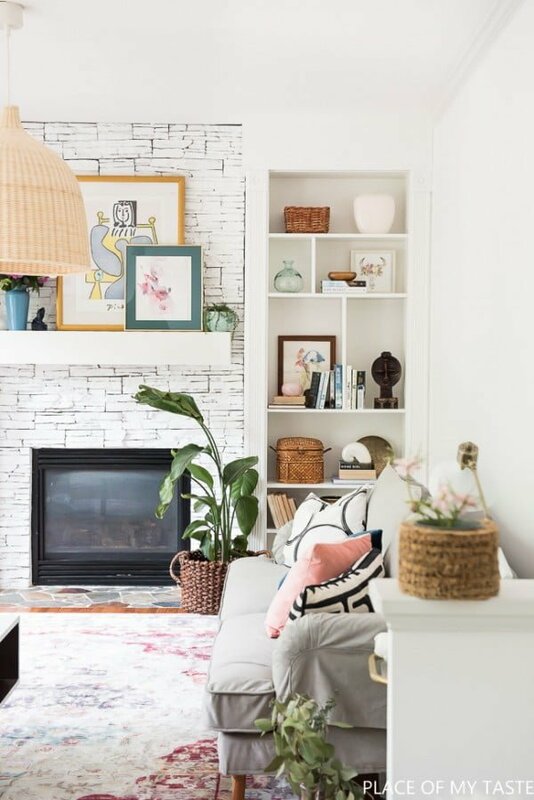 The built-ins in this living room are incredible, and they provide well-needed storage and a place to display amazing accessories that help in tying the space together. 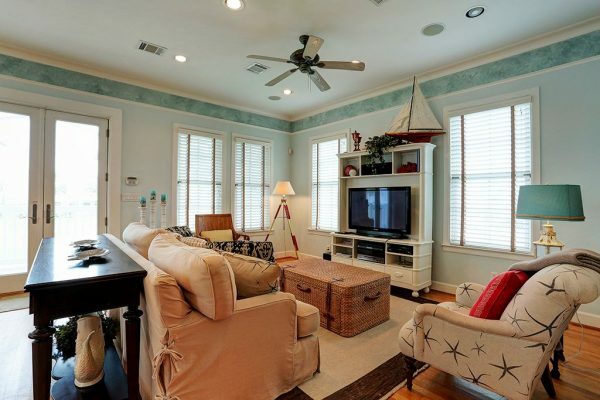 The wainscoting in this living room adds lots of class and elegance to space. The crispness of the whiteboards contrasts wonderfully with the dark wood floor. This living is delightfully designed and the color scheme, with its different shades of blue and green, plays the all-important role of lighting and brightening the space. A cleverly designed space to represent both the modern and conventional styling techniques. 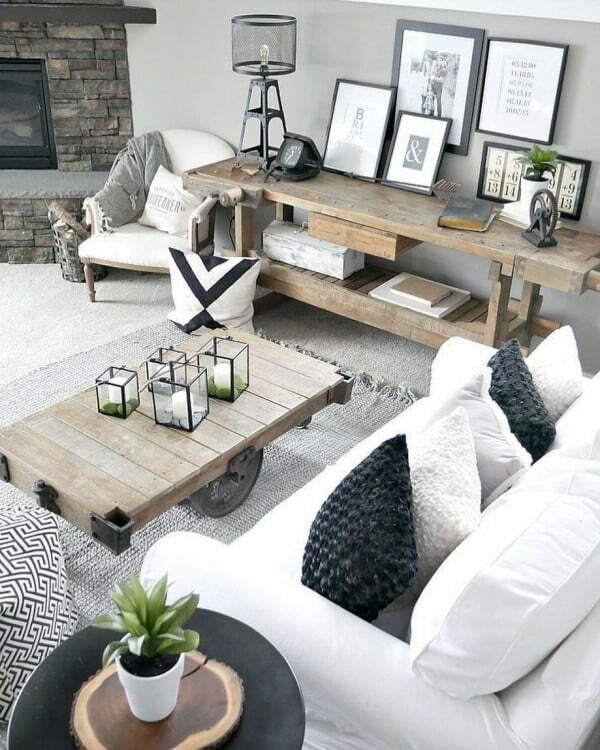 A perfect balance between chic and country! Enjoy a pleasant and mellow rustic atmosphere, oozing with commodity and elegant charm. You can almost hear yourself relaxing! 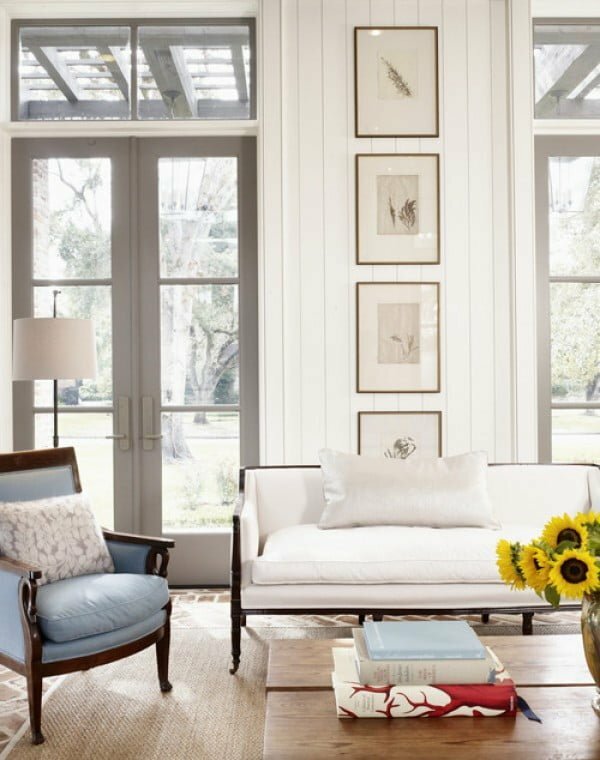 This pristine space is decorated based on old Southern glamour. The retro setting provides a Mediterranean feel and a modern knack for detail. The retro ceiling and wooden features create an engaging and soothing environment for those with particular tastes in furnishing. A modern-day approach to the traditional mountain cabin outlook. A perfect blend of material contrasts, creating a practical and detail-oriented surrounding. A homey take on the cinema-meets-countryside room. This high-ceilinged and spacious setting is the epitome of a ‘sass, class and built to last’ farmhouse! 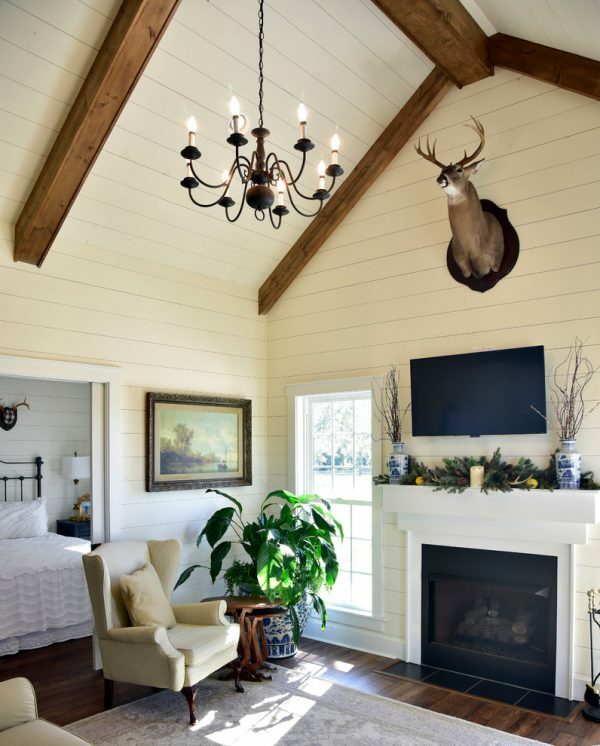 The warm furnishing tones ideally complement the dimmed and vintage farmhouse lighting of this statuesque-looking ranch room. Let the sunshine in! 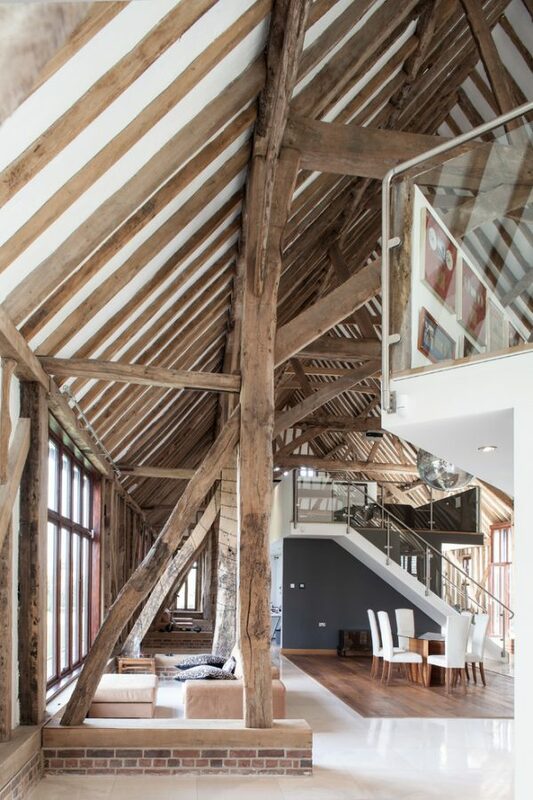 With sky-high wooden pillars and a vast space to play around with, this barn-inspired space perfectly depicts class, elegance and sophisticated minimalism. The cleverly installed sliding door interconnects the bright living room and dynamic kitchen. 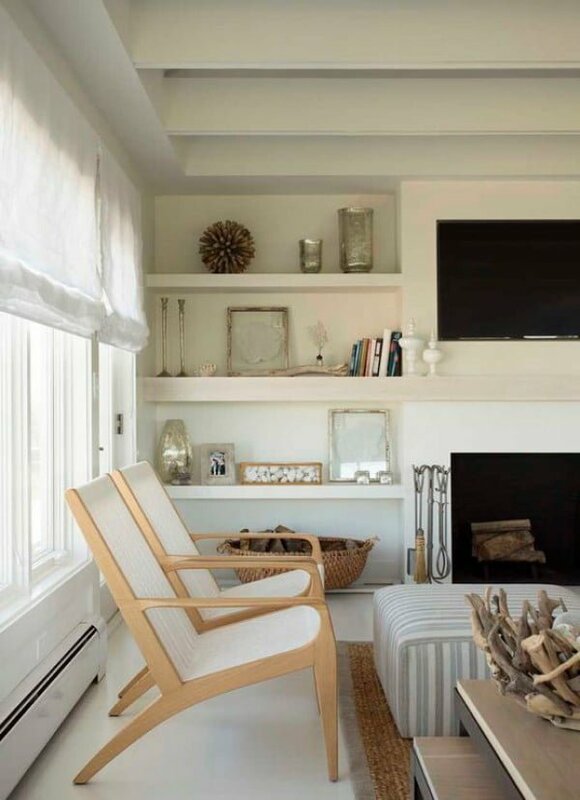 The excellent balance of wood and linen perfectly combines warm and sunny tones into a private paradise! Surrender yourself to sunrays, cozy fireplace warmth, and wisely combined pastels, reflecting the true definition of tranquility. 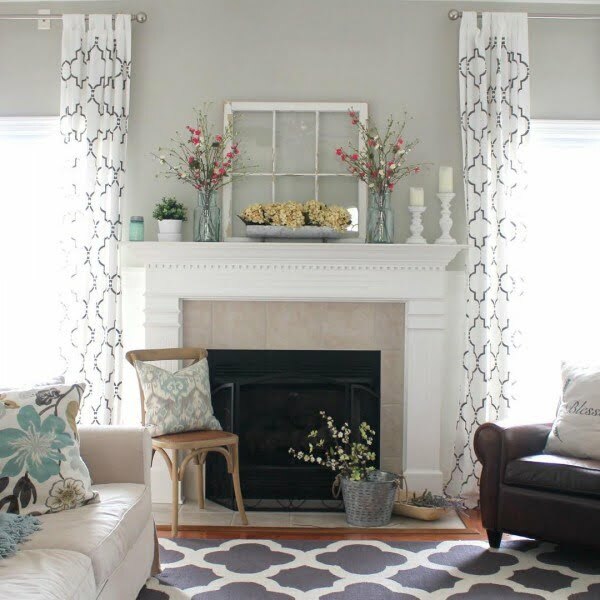 This space is decorated with a perfect grey-tile fireplace and cozy mix furnishing. The architect thoughtfully intertwined yellow tones and shades to embodies a fairytale-like ambient. With a carefully selected combination of red and neutrals, space is designed to bring a sense of hominess and still capture the incredible imagination of detail. 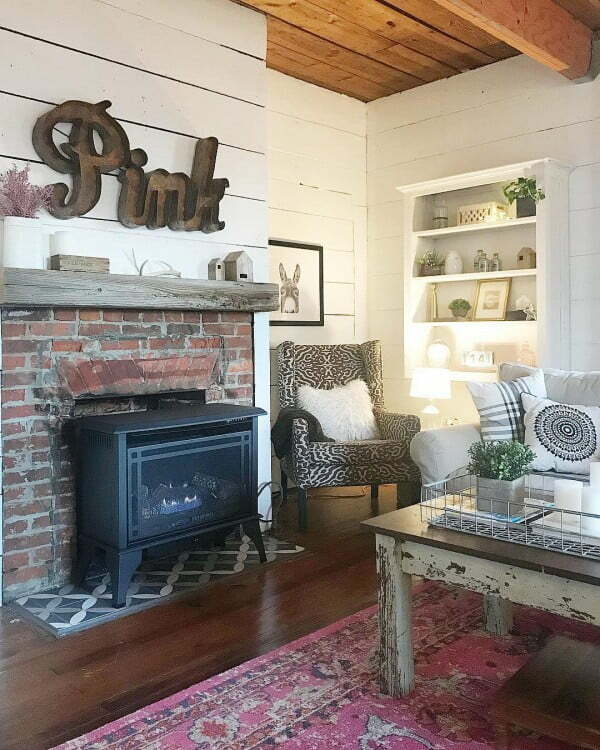 The playful fireplace bricks give this warm home a luxurious appearance, complemented by a vibrant wood assembly and perfectly designed furniture. 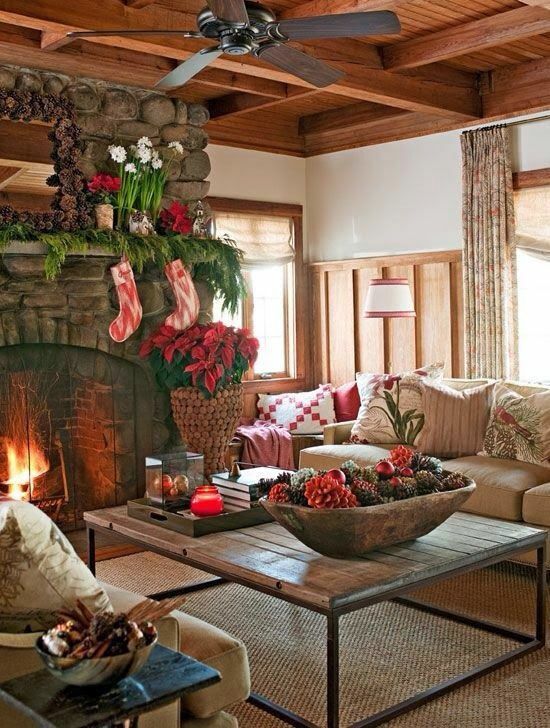 This practical and comfortable setting uses traditional and contemporary elements which warm up the atmosphere and offer a strategic play of colors. 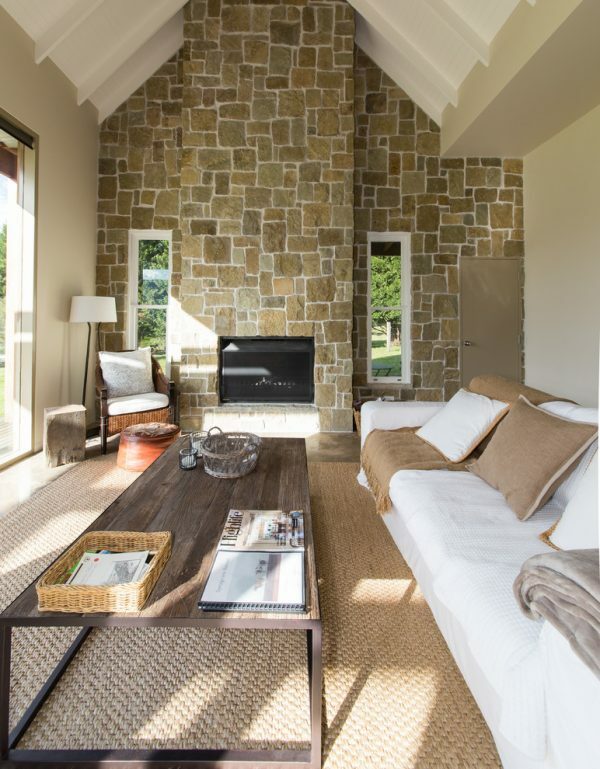 The stone, ceiling-high walls represent a perfect fireplace nest, with just the adequately balanced amount of neutral furniture shades. The reflecting mirror and built-in bookshelf, followed by smart contrasts of grey, navy blue and white shades give this room an almost nostalgic and utopic flavor. 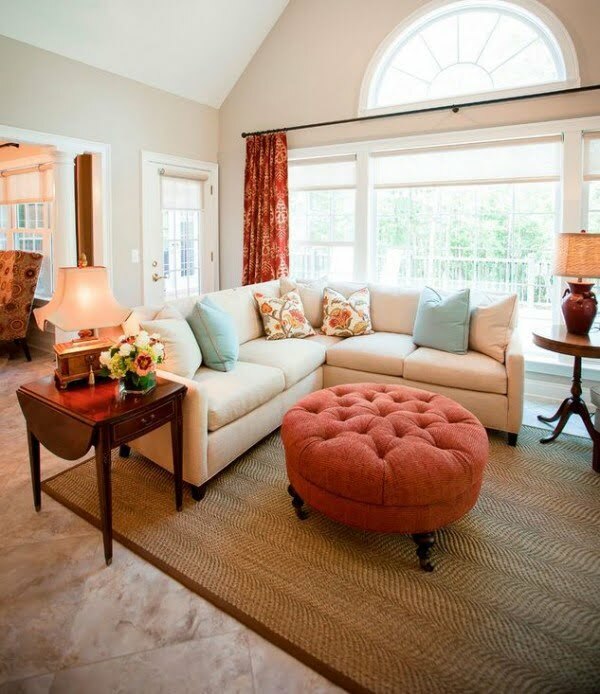 This fancy, yet cozy living room creates a beautiful pad for families who enjoy their comfort and a hint of greenery. 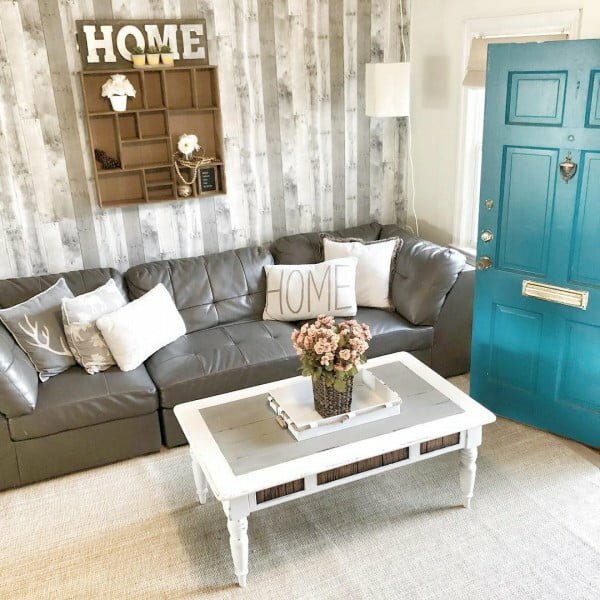 The soft and inviting blue tones incorporated in the room’s furnishing and decorative details perfectly complement the playful wooden wall sign boards, giving the space an airy and breezy feel. This kitchen triggers joy and excellent taste in interior design. The rustic cupboard, enhanced by a cleverly positioned armchair capture the true essence of minimalistic living. 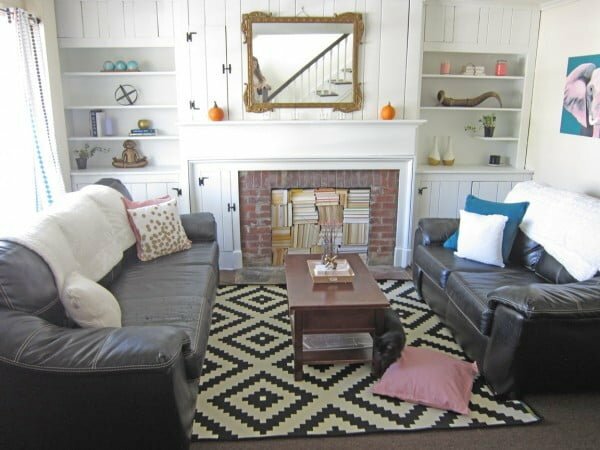 From the dynamic cushions to the retro air-conditioning and patterned armchair, this ranch-like setting will encourage you to dream. 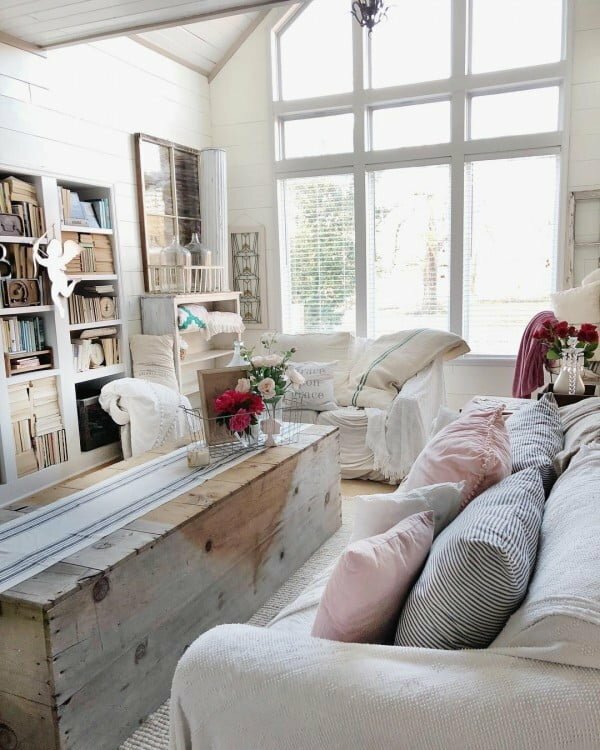 The rustic feel of this room will take you back in the day, where barn doors were cool, uni-color carpets were practical, and the smell of cherry blossom was in the air. The navy-white walls complement each other magnificently. 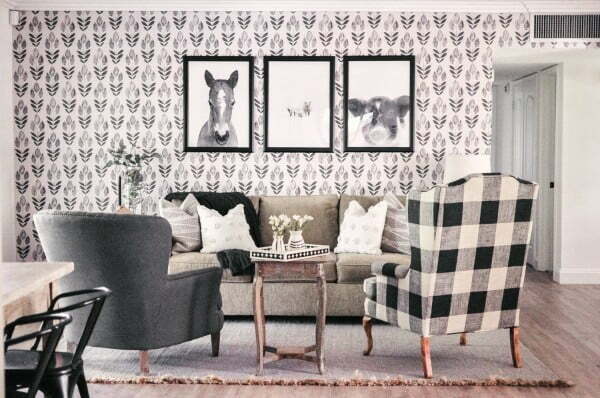 Add stylish furnishing and decor to the equation, and you got yourself a countryside miracle. Strip off your layers, and let me see who you are. 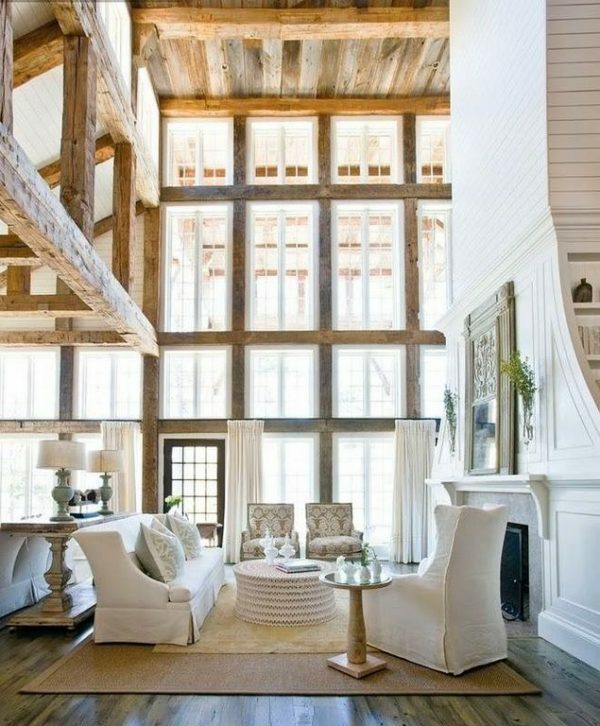 The minimalistic vibe of this room is amazingly soothing, while the inside renaissance window steals the entire show. The vintage and vivid Persian rug perfectly resemble a nostalgic setting, amplified by toned-down furniture, wood plank flooring and an exceptional sense of detail. This private and secluded nest is a combination of soft baby shades of pink and light fabrics which ooze romanticism and elegance. 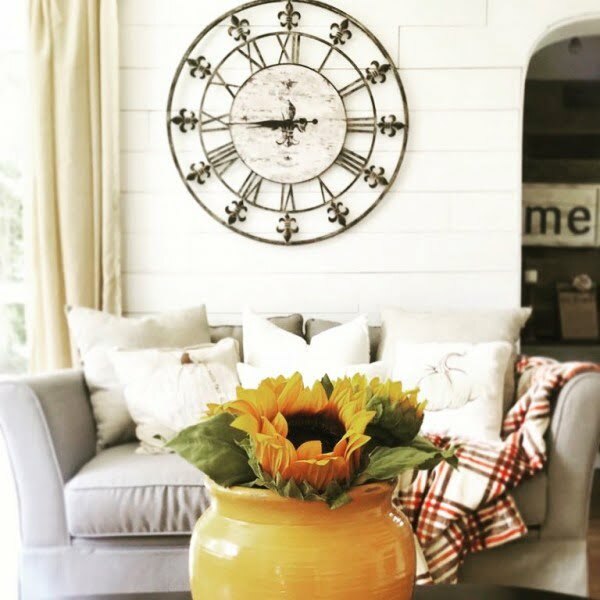 An immaculate instinct for details- from the empty photo frames to the sizzling wall clocks, this room captures the restless hippie spirit and into ambient from a modern-day standpoint. The sliding combo door creates a vast space, creatively arranged with adorable wooden details and ornaments which give the house an uplifting mood. 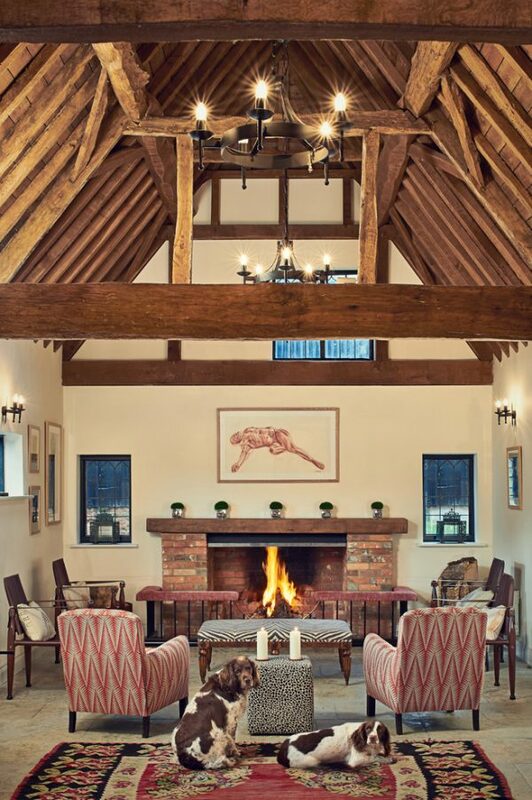 A pure example of masterfully used space, with dynamic and focal fireplace and rustic barn windows with outer wooden shutters! The wrought iron chandelier emphasizes the tall wooden pillars are revealing a spacious setting that leaves out an impression of both sophistication and class. 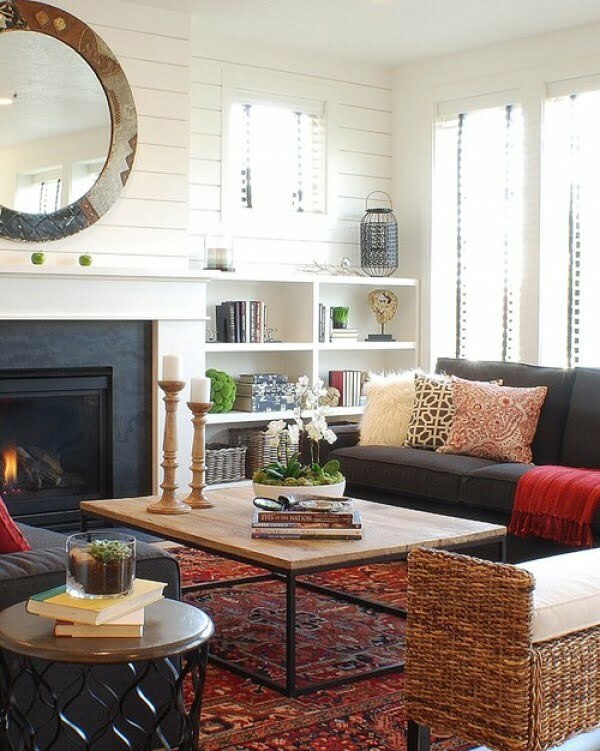 The vintage ventilator and practical coffee table go hand in hand with the impactful fireplace and red details which add excitement to the bright mono-color pattern. The entangled Lilly chandelier plays super stylishly with the all-white room walls, letting all pinkish details give the setting an earthy flow. 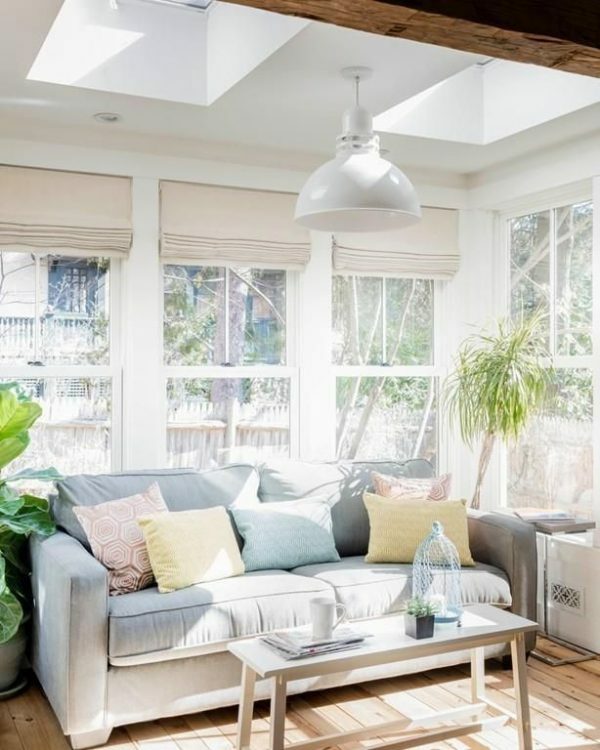 The high ceiling and extra top windows allow light to penetrate the fresh palette of baby pastels, creating an almost glass garden-like feel. 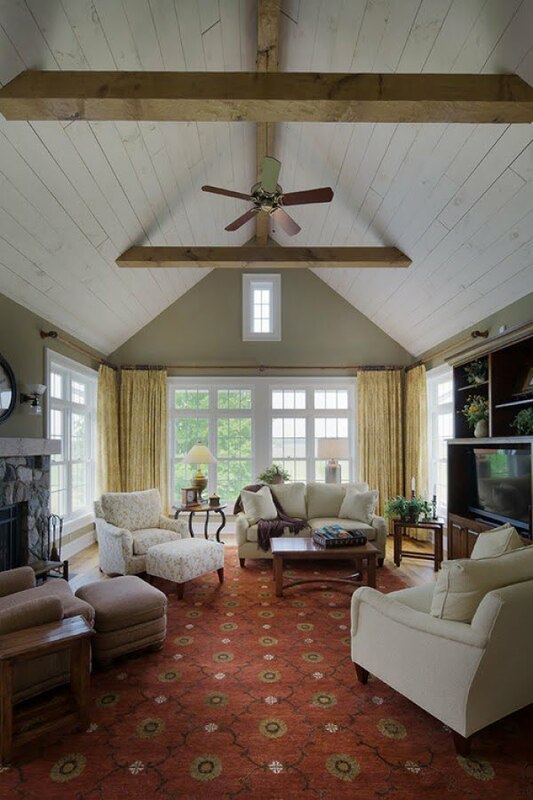 The cathedral-inspired ceiling overlooks a vast room with sky-high windows overlooking the mountainside and patterned porch-inspired living room set. The room is beaming with sunlight while the interior design is based on a practical, yet classic furnishing set and vivid details. This adorable corner uses smart pallets and fabrics supported by retro elements which give out a sense of serenity. With its cathedral-inspired ceiling and window-packed walls, this rustic mansion speaks of aesthetics and quality, while delivering a sense of practicality and divinity. 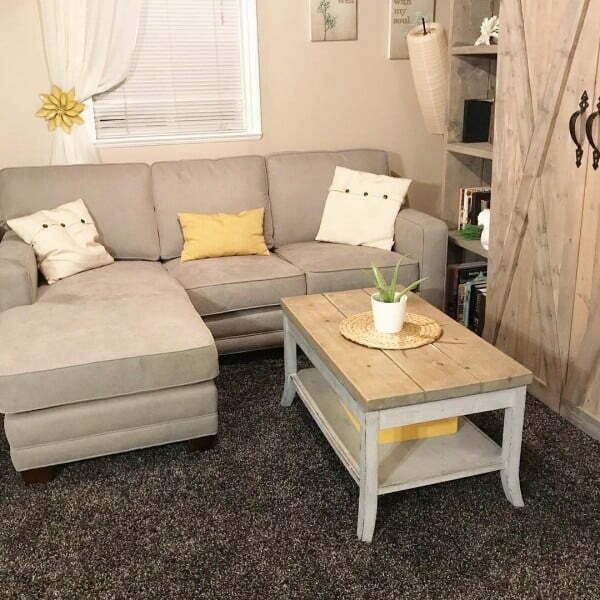 The warm yellow palette is an excellent match for the almost royal-like leather and suede living room set. The dark feel of the room is contradicted by the medium-sized and patterned pillows. 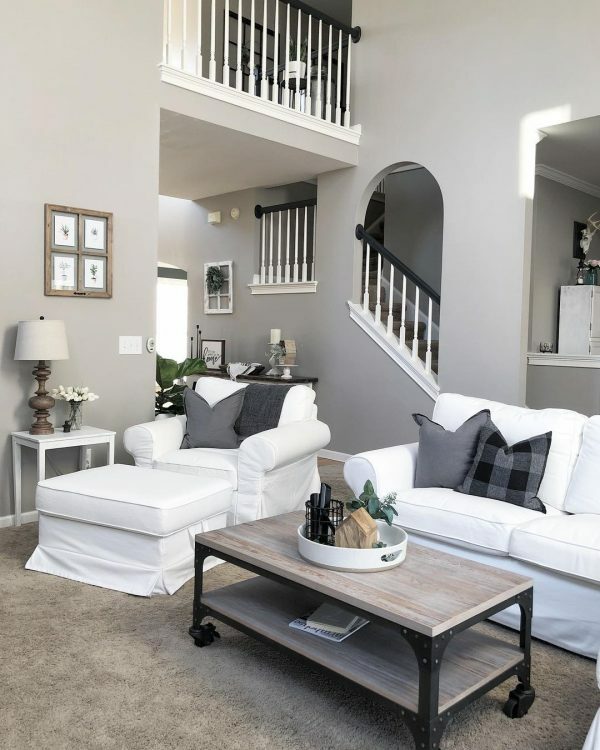 A contemporary two-story living room, showcasing a wooden staircase as a central piece, overlooking a neutral living room set and unconventional coffee table as a twist. The room echoes countryside comfort through its perfectly matched built-in shelves, exposure to sunlight and a cream ottoman, thoughtfully used as a coffee table. 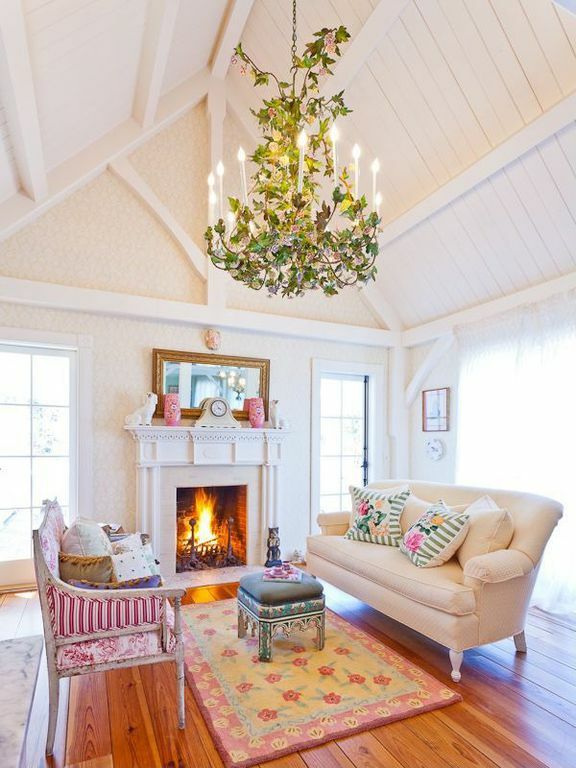 This room revolves around a great iron chandelier which is the best opposite for the romantic and delicate furniture.